WITH so many new players entering NAB League Girls sides as plenty missed out due to AFL Women’s Academy duties, there are few new faces in the Draft Central Team of the Week for Round 6. There are also plenty of regulars who stepped up in the absence of teammates, but now there are no players who have made the side every single week, showing a great diversity of talent among the competition. Bendigo Pioneers, Geelong Falcons and Northern Knights all enjoyed impressive wins, sitting in the top four of the NAB League Girls ladder. Those three sides all had three players in the Team of the week, with six sides having two players and the remaining three sides – Calder Cannons, Murray Bushrangers and Western Jets all having the one nominee in the team. Geelong Falcons’ undefeated streak continued on the weekend and Paige Sheppard and Mia Skinner‘s terrific seasons continued, named in the Team of the Week again, along with midfielder Luka Lesosky-Hay. Northern Knights also remained undefeated with just a draw as the only blemish on an otherwise top season so far. The Knights had to overcome a number of key personnel losses to post a big win over Gippsland Power, with Jess Fitzgerald, Phoebe Chisholm and Nell Morris-Dalton crucial in that win at Garfield. Their opposition had a number of impressive players with Chandra Abrahams being a tackling machine and flowing well between the arcs, while Megan Fitzsimon had a round-high 28 touches. The other team with three players in the Team of the Week was Bendigo Pioneers, who enjoyed a hard-fought win over Dandenong Stingrays. Brooke Hards was named in the midfield yet again continuing her top season, along with Tara Slender at centre half-back and Jordyn Jolliffe in attack. All three players are in three different birth years showing the vast impact that talented girls of all ages can have on the competition. Their opponents had a couple of familiar faces in the Team of the Week with Brooke Vernon and Zoe Hill slotting into the side for yet another week. Also in defence are a couple of individual team nominees in Murray Bushrangers’ Sophie Locke and Calder Cannons’ Georgie Prespakis who while predominantly midfielders, drift back and help their defences. Rounding out the Team of the Week midfield is Sandringham Dragons’ ruck Celia Cody making her debut in the team, along with Winnie Laing who was best on ground in the Dragons’ win over the Greater Western Victoria (GWV) Rebels. The Rebels had two players in the Team of the Week as well, with Ella Wood returning to the side along with Nyakoat Dojiok who has been impressing across the ground. In attack, Eastern Ranges’ Serena Gibbs has been named at full-forward after a strong show of marking and long kicking against the Cannons, as well as teammate Tess Flintoff who was named the Draft Central Rising Star of the Week. 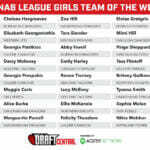 Rounding out the side are Oakleigh Chargers’ captain Mimi Hill and her teammate, Chloe O’Malley, as well as Western Jets’ captain Elisabeth Georgostathis who has been a regular in the Team of the Week this season. It was a tough week to decide on just 24 players with Gippsland’s Grace McRae, Calder’s Felicity Theodore and Eastern’s Tahlia Merrett among those very close to making the team this week. ROUND 6 of the NAB League Girls saw a host players out with AFL Women’s Academy duties but that did not stop the Geelong Falcons and Northern Knights from continuing their winning ways. Geelong once again proved to be the front runners of the competition while Oakleigh also flexed their muscles with a big win over Murray. The round also saw some close clashes between the Eastern Ranges and Calder Cannons along with Greater Western Victoria Rebels and Sandringham Dragons with both games coming down to two kicks or less. Gippsland: G. McRae, N. Webber, S. Walker. Northern: L. Picioane 3, J. Simpson 2, J. Fitzgerald 2, N. Morris-Dalton, T. Smart, M. Ramsay. After a slow start, Northern Knights pulled away from Gippsland Power to ensure they remained undefeated after six rounds and sitting just two points behind Geelong Falcons on top of the table. In the match against the Power, Northern booted nine goals to three after quarter time to secure the 10.7 (67) to 3.4 (22) win, but not without some resistance from the home side. After the match was moved from Preston City Oval to Garfield, the Knights became the visitors but looked all at home once they had settled in despite missing an number of their top stars – Gabby Newton, Britney Gutknecht, Ellie McKenzie and Sarah Sansonetti – who were all out on AFL Women’s Academy duties. The Knights’ depth stepped up in their absence, with Jess Fitzgerald being the key influencer through the midfield, collecting 16 disposals, five marks, four inside 50s and booting two goals, while Phoebe Chisholm led her side for disposals with 19, as well as two marks, four tackles and five rebounds. Ash Snow was prolific around the ground, while Nell Morris-Dalton continued her strong season rotating between ruck and forward, while Lanarose Picioane who booted three majors in an impressive performance up forward. For Gippsland, Grace McRae was named the best for her 19 disposals, three tackles and a goal, while Chandra Abrahams and Megan Fitzsimon continued their great seasons, combining for 49 disposals, 12 tackles and eight inside 50s in a losing side. Nikia Webber also had a solid performance with a goal, while Matilda Van Berkel was strong at half-back. Oakleigh: J. D”Amato 2, M. Bertuna 2, T. Morton, A. Peck, E. Harley, N. Xenos, K. Kearns, T. Cowan, A. van Oosterwijck. Murray: C. Boschetti 2, T. Verhoeven. Oakleigh Chargers have bounced back from their second loss of the season to record a huge nine-goal win over Murray Bushrangers. Both sides were close in the first term with two goals apiece, before the Chargers kicked away with a three goals to one second term to open up a 14-point lead. Despite their determination in the first half, Murray was unable to restrict Oakleigh in the second half as the Chargers booted six goals to zero to run out 11.8 (74) to 3.2 (20) winners. Jasmine D’Amato and Melanie Bertuna both booted two goals for the Chargers among nine individual goalkickers in a massive team effort. Captain Mimi Hill led from the front with 20 touches, two inside 50s and three rebounds, while Chloe O’Malley was named best on ground for her 14 disposals, three tackles and two inside 50s. Nicola Xenos was influential in getting the ball inside 50 with 13 disposals, one mark, four tackles, five inside 50s and a goal, while Emily Harley booted another goal to take her season tally to 11. For Murray, Sophie Locke was named the best, collecting 13 disposals, four marks and four rebounds while laying an equal-team high eight tackles. Abby Favell was the top disposal winner once again with 14 touches, three marks, four tackles and two inside 50s, while Teagan Brett had 13 disposals and eight tackles in the defeat. Oakleigh now sits sixth after the win, just two points outside the top four, while Murray are ninth but still clear of the Rebels, Jets and Power. Eastern: S. Gibbs, S. Collard, T. Flintoff, J. Dunning. Calder: G. Prespakis, T. Gillard, E. Yassir. Eastern Ranges have kept themselves in contention for finals heading into the last three rounds after an impressive four-point win over Calder Cannons. The Ranges are now within percentage of the top four, sitting just adrift of both Calder and Bendigo Pioneers who sit third and fourth respectively with 16 points apiece. It was a fairly scrappy game throughout with both sides applying plenty of defensive pressure around the ground as Eastern’s talls stood out with their strong marking at both ends. Where possible the Ranges moved the ball quickly with short, sharp passes, whereas Calder wanted to run the ball and kick long inside 50. Both methods were effective at times throughout the game, but the key defence of Eastern held strong with Tahlia Merrett taking a number of good intercept marks in defensive 50. Serena Gibbs also provided an option between half-back and half-forward, taking marks and booting the ball long to put it in front of the Eastern runners. Tahlia Gillard provided that target for Calder and early looked like breaking the game open, booting a goal and missing a couple of opportunities before the home side restricted the inside 50 entries. Georgie Prespakis and Tess Flintoff were impressive for their respective sides providing plenty of run, while Tarni Brown and Felicity Theodore assisted well through the midfield. In a see-sawing final term that almost saw Calder steal the win through Emelia Yassir, it took until the final minute for Flintoff to mark inside 50 against the boundary and calmly slotted the set shot for the four-point win. It was tough muck for the Western Jets on Sunday afternoon as they hosted ladder leaders, Geelong Falcons at Williamstown. Despite a relatively even first quarter the undefeated Falcons were able to pull away and deny the Jets opportunities in front of goal, running away to a 75 point win. The Jets started well defensively, crowding the Falcons and making it difficult to get a clear kick on goal, but were unable to move the ball downfield to their advantage. A beautiful kick inside 50 from Geelong debutant, Gabbi Featherston set up the first goal of the game after almost eight minutes of play, showing how well the Jets held their ground early. However, Western’s good fortune dwindled from there as the Falcons used their depth of their talent to kick away. The Falcons proved to be dangerous up forward as the Jets struggled to contain their opposition without two of their main ball magnets in Isabella Grant and Isabelle Pritchard. Paige Sheppard (22 disposals, four tackles, five inside 50s) and Luka Lesosky-Hay (20 disposals, two tackles) switched on as the Falcons started to pile on the majors, with the likes of Renee Tierney, Tamika Lewis and Poppy Schaap kicking two goals apiece while Mia Skinner (four goals, 18 disposals) put on her best performance so far this season. Tierney’s tackling pressure was crucial, notching up eight as the Jets tried to force their way through Geelong’s defensive setup, while Lesosky-Hay showed some good footy smarts as she continuously pushed the contest back up the ground. The Jets were unable to break through Geelong’s midfield barricade as the Falcons crowded and contested every possession, outrunning the Jets and scooping up the ground ball with precision. The Jets showed some good signs in attack in the third quarter, managing some great passages of play through the middle of the ground. Though unable to capitalise, Western’s defensive pressure inside forward 50 granted them opportunities in front of goal, gifting them their only score of the game – a rushed behind off the back of a good attempt on goal from Taya Meiers. Elisabeth Georgostathis (14 disposals, six tackles, six rebounds) showed her versatility in the backline, with her ability to read the play enabling her to know where the ball would be placed. Georgostathis was arguably one of the best for the Jets, putting constant pressure on her opposition, while a fantastic tackle in the final quarter saved an almost certain goal. Taylah Kolevski dominated hitouts with 23 alone, also racking up four tackles. Bendigo: J. Jolliffe 2, E. Snell, B. Hards. Bendigo Pioneers have given themselves a terrific shot at finals after overcoming Dandenong Stingrays by three goals at Epsom Huntly Reserve on Sunday. In a low-scoring affair, the Pioneers got the job done by restricting the Stingrays to just one goal in the game, and only four behinds after quarter time. Despite this, the game was tight throughout and it was not until the final goal of the game that the Pioneers could relax and enjoy their fourth win of the season. Jordyn Jolliffe played the best game of the season with 20 disposals, four marks, four inside 50s, two tackles and two goals in a best-on-ground effort, while Tara Slender was terrific up the other end, racking up 12 disposals, five marks, three tackles and two rounds in the win. The midfield of Brooke Hards, Eloise Gretgrix, Maeve Tupper and Annabel Strahan again took control in the absence of key Stingrays, Molly McDonald, Tyanna Smith and Isabella Shannon. Hards and Tupper both had 18 touches with Hards also laying eight tackles and having three inside 50s and four rebounds. For the Stingrays, Zoe Hill stood tall in defence with 12 disposals, three marks and three rebounds, while Brooke Vernon‘s super season continued, amassing 18 touches, four marks, five inside 50s and six rebounds, while Grace Hodder laid seven tackles from her 15 disposals. With Geelong Falcons, Calder Cannons and Oakleigh Chargers in the final three rounds, the finals are within the Pioneers’ control in what is a tough draw on the run home. The Stingrays can still make finals if they can topple Oakleigh Chargers next round with Murray Bushrangers and Western Jets in the final two weeks. GWV: E. Friend 3, R. Saulitis. Sandringham: E. Angelopoulos 2, C. Murphy 2, I. Eddey. It was a tight contest from start to finish with Sandringham Dragons claiming a seven-point victory over Greater Western Victoria (GWV) Rebels. It was neck and neck in the first term with either side unable to pull away going into quarter time at seven points apiece. The Dragons piled on two goals in the third term, keeping GWV to just one point for the quarter. But the Rebels were not going down without a fight applying all the scoreboard pressure to come within striking distance but just falling short after a gallant effort. Without Sophie Molan and Maggie Caris, GWV looked to the likes of Renee Saulitis to lead the way. Saulitis made her presence felt on the field slotting a major, she was ably assisted by teammate Ella Friend. Friend dominated for the Rebels kicking three goals, racking up 10 disposals and laying a team high six tackles. Nyakoat Dojiok also led the way for her side with a team high 18 touches and four inside 50s showcasing the work she does across the ground. She was closely followed by Brook Thompson who also amassed four inside 50s, while 12 of her 15 disposals were kicks. Georgia Pidgeon also impressed with 14 touches while Ally Trigg took five marks to accompany her 10 disposals. Sandringham were missing some key players with Alice Burke, Eliza McNamara and Molly Denahy Maloney all out with AFL Women’s Academy duties but that did not seem to stop them from claiming the four points. Charli Murphy showed her hand up forward slotting two majors for the game while Ebony Angelopoulos also chipped in with her two goals. Through the midfield the Dragons were led by Winnie Laing who finished the afternoon with a game high 20 disposals and seven tackles. She was helped out by Chloe Saultry who amassed 16 touches with all of them kicks and a whopping six inside 50s. Bella Eddey was also impressive for Sandringham getting involved on the scoreboard, laying six tackles and racking up 13 touches for her efforts. OVER the weekend we managed to get to all of the NAB League Girls games and took some notes on some of the players to watch highlighted by respective Talent Managers. All views are the opinion of the individual writer. She applied good defensive pressure and worked hard to trap the ball throughout the game in her attacking half. Theodore showed good speed, tracked the ball well at ground level and consistently ran hard to win the footy. Really good read of the play and used her footy smarts and speed to break away from her opponent and kick to a teammate. She was clever around the stoppages to position well and read the tap to get into an attacking spot and set up a forward thrust for Calder. Patrikios led the way for the Cannons with her good hands out of congestion and impressive spatial awareness to clear the mess. She took a few strong marks and displayed her ability to read the play well. Patrikios backed herself in at the contest and used her clean hands at the stoppages to dish off to teammates. She had a beautiful passage of play in the second picking the ball up off the deck fending off a player and then kicking to a teammate. Patrikios showcased her good evasive side step to shake off an opponent and really built into the game come second quarter. She read the flight of the ball well, provided some repeat forward 50 entries and offered a good lead in the forward 50 to glove the mark and then slot a goal. She showcased her speed going for a run through the middle and bombing the ball long into the forward 50 and provided plenty of good link up play through the middle. Good one on one contests and made her opponent work for it throughout the game. She contested everything that came her way and laid a strong tackle in the second quarter. Prespakis worked her way into the game more in the second quarter and moved forward in the second half slotting a goal in the opening minutes of the third term. She showcased her clean slick hands around the stoppages and read the play well to impact the contest. Credit to her footy smarts she stayed down and got a good crumbing goal in the third breaking away from the pack and slotting it through the middle for her second for the quarter. Her quick hands helped to set up a shot at goal for her teammate by tapping the ball to her teammate running into the open goal. She presented up at the footy continuously throughout the game and ran hard to create space in the forward 50. She impressed with one passage of play running down the wing taking a couple of bounces burning off opponents and dishing off a handball to a teammate. She was in everything and was a real bull around the contest for Murray. She laid a couple of strong tackles and applied good pressure. Favell led up at the kicker, contested well in the air and constantly worked hard around the stoppages. She bodied up on her opponents proving she was not afraid to put her body on the line. Favell showcased her good booming kick and took an impressive intercept mark coming out of Murray’s attacking 50. She was quick in transition and went for a run but just could not get enough on the kick to score a goal. She showed great courage to take a big mark in the third quarter and worked hard both in attack and defence for the Bushrangers. Locke applied heaps of defensive pressure on the ball carrier laying some strong tackles across the ground. She was not afraid to put her body on the line and worked tirelessly to try and win the contest or extract the ball at stoppages. She impressed with her ability to read the flight of the ball and impact the contest when the ball came her way. Brown showed her good evasive skills to break through the middle of the ground and kick long to her attacking 50. She was composed under pressure and used her long booming kick to push the ball forward for the Bushrangers. She had good spatial awareness and worked hard throughout the game tracking the ball well at ground level. Brown offered some good leads into space to help open up at the game for the Bushrangers. The middle-age prospect was instrumental in her key defensive post once again, dominating the air and cutting off many of Oakleigh’s forward forays. Hartwig’s intercept and overhead marking is outstanding for a player who is not yet top-age, and she was so composed in possession when rebounding. While her hands overhead are strong, Hartwig slid for a few marks in the second half which did not quite stick, but still highlighted her superior reading of the game from behind the ball. Hartwig already looks like a complete and dynamic defender, and it will be interesting to see if she can transfer her marking ability when tried up forward. Burke was again the Dragons’ key player through the midfield, showing her trademark tenacity to pry the ball clear and tackle hard in the clinches. Her crunching early tackle on the stronger Emily Harley was an example of that, as was her constant pushing forward of the ball from stoppages. Burke’s steady mark under a high ball to send the Dragons inside 50 was another good moment, and it just seemed that she played a key part in setting the tone for her side. Working in tandem with Burke and following her lead well, Laing won a good amount of ball with second efforts by following up her possessions. Another to push the ball forward from congestion, Laing had a nice clearance in the third term to enter Sandringham’s forward 50, while also taking a sharp mark in attack to set up a set shot deep when the game was in the balance. Purcell was in the mix early with some nice possessions to start the game, but somewhat faded in the second half. Positioned on her customary wing, Purcell provided a good amount of outside run and was influential between the arcs. A good overhead mark in the second term and a composed read of a high ball in the same stanza showed Purcell’s versatility, and it would be good to see her display those flashes more often. Oakleigh’s best ball winner on the day, Hill contributed a wealth of work throughout the game. She seemed to be involved in everything, taking the game on and accumulating well with clean touches around stoppages. Her hands overhead early on were impressive, as was her efficiency by foot with short kicks to teammates in space. A bursting clearance in the second term caught the eye, and Hill was unlucky overall not to have helped her team to the win. The strong utility was tried in the midfield, and did well to make her presence felt in tight spaces. While she could not quite collect the ball with one touch and burst away, Harley won a good amount of contested possessions and was not deterred by being caught holding the ball in the second term. Harley looked to be learning as the game went on and did the basics well as her midfield time wore on, but was thrown into defence in the final term to add solidity to the back six. A mark in defensive 50 late on looked to be a crucial contribution, but a Sandringham goal not long after denied the Chargers a draw. Porter was Oakleigh’s only multiple goalkicker, and boy were both of them impressive. Her first came in the second quarter, using her electric speed to take on and burn an opponent and finish into an open goal. Porter’s second goal was from long range, coming out of seemingly nowhere as she booted the ball from the arc and bounced it home. The speedster was dangerous around the ball, competing well and attacking it hard whenever given the opportunity. Porter also attended a heap of centre bounces in the second half, and looks a versatile type who is damaging in strong bursts. Spending a fair amount of time in the ruck, Peck won her share of hitouts and followed up well to win the ball at ground level. While she looks raw at this stage, Peck showed glimpses of her potential with a nice sliding mark in the third term and a neat kicking action to send the Chargers inside 50. The star of the show up forward, booting 5.2 and looking dangerous whenever the ball went near her. She had a couple more chances to add to her tally, but could not quite convert, though with the blustery conditions, goals were difficult to come by as shown in the 8.15 scoreline. Snell has a great goal sense to be able to turn opponents inside out and snap the ball through the big sticks with very little time. Great composure from her inside 50. Along with Annabel Strahan, was the key playmaker behind getting the ball inside 50 to create opportunities for Snell and the other forwards. She was often winning the contested ball and extracting it out of a stoppage via handballs to teammates. She laid tackle after tackle, applying terrific defensive pressure to her opponents, and set up the first goal to Snell through a fend off and great kick to her at half-forward. Hards’ first steps out of a stoppage can burn off an opponent and she has a great first touch. Had a chance on goal herself in the second term but just missed. Backed up last week’s impressive game with another good effort. Working with Hards in midfield, Strahan was able to keep the ball going forward and is able to sum up a situation quickly and get boot to ball under pressure. She set up a goal to Snell in the second term with a quick kick, and would often win the ball on the outside or receive the handball and pump it long inside 50. In the fourth term she had a long-range shot on goal from outside 50 but the breeze just went to the left and it bounced into the post. Did a few nice things around the ground, missing a set shot early in the game but continually went in to find the ball. She showed good core strength in the second term to handball while being tackle, and was able to kick well on the left to a leading forward. She had another good play in the final term by kicking around the body into midfield, repelling a Gippsland Power attack. Did not always see much of it such was the Pioneers’ dominance early, but when required, Slender peeled off her opponent and would fill the hole in defence. She has really clean hands at ground level and was able to pick-up off the deck and kick long along the wing. Her body position one-on-one and vision to kick to a free teammate was noticeable. Considering she is a bottom-ager, she already has the game smarts of a more experience player and knows when to keep the ball live without taking possession. She is also quick to get boot to ball under pressure. One of Gippsland’s more impressive players through the midfield, she just refused to give up, constantly attacking the ball and the ball carrier. She showed good smarts to cleverly tap the ball along the ground in the first term and was unlucky not to be paid a mark in the final term when she flew for a specky. Her long kicking was a help in the swirly conditions and even with the game out of reach, Abrahams continued to crack in hard and win the ball. Tried hard throughout the day and her powerful kicking was on show when she was able to win the footy. Not a huge possession winner in the loss, she provided great defensive pressure and tried to kick long at every opportunity. Battled hard through the midfield and half-back, attacking the ball and using quick hands under pressure. One of the better Power players on the day, she laid a number of big tackles and was mostly right at the coalface trying to get the ball out. Her defensive efforts were noticeable in a game that was highly contested at times. She had a quick gather at half-back and able to kick out of trouble in the first term, and then led up at the football along the wing in the second term, unfortunately just slipping from her grasp. Andrews was another Power player who showed a fierce attack on the ball carrier and had good second efforts, taking a good intercept mark late in the game and kicking long. It was a tough day to be a forward in these conditions, especially with how impressive the Bendigo midfield was in this match. Webber did get to show off her versatility after quarter time, playing through the midfield and even full-back. Grant put her clean hands on show, worked well with Isabelle Pritchard down back to create scoring opportunities for the Jets. Grant also caused great difficulty for the Rebels with her ability to apply constant pressure on the ball and ball carrier and some well-executed tackles through the midfield. Georgostathis was great among the action, and seemed to be everywhere on the field. Put on her best performance in the final quarter when she showed off her two-way running ability to be constantly around the ground ball and creating opportunities up forward. Some fancy footwork and speed led to a brilliant forward 50 entry and goal assist in the final term, putting the ball in the perfect position for a strong mark in front of goal. Had a snap on goal with five minutes left in the match but registered a behind, but showed off some footy smarts in the way she wheeled around and got the ball off the boot under pressure. Pritchard was one of the most influential players on the field, and was a constant buffer off half back with her readiness for every contest and ability to mark under pressure. Some great marks taken by Pritchard in the second half helped to keep the ball trapped forward to create scoring opportunities, while also demonstrating a good understanding of ball placement when running back for a goal-saving mark. Worked well with teammates to put constant pressure around stoppages off half back, and also kept the likes of Isabella Simmons from having too much on an influence on the match. Saulitis showed off her ability to run both ways in this match but was unfortunately unable to convert for the Rebels after a beautiful kick over the top saw her given an opportunity for a running goal in the goal square early in the first term, but hit the post for a behind. Did not have much of an opportunity to receive the ball inside 50 after the first quarter and at times was double teamed to prevent her access to the ball at stoppages. Wood put her running and stamina on show with some great movement around the ground. Showed some good footy smarts with a clever punch to the advantage of a teammate at a stoppage on the wing, instinctively getting the ball out of a pocket of Jets players. Had a good understanding of where teammates were when under pressure to scoop up the ground ball and handball out of the pack, while also working well with Sophie Molan to move the ball to advantage. Molan had some really good moments early, put a great deal of pressure on the air ball and going for the mark, and really exerting some influence on the field. Spoiled some opportunities for the Jets, showing some good instincts in a pack scenario, but missed a few marks early under pressure. In the second half she showed her commitment to the footy, putting her body on the line to spoil a kick that was almost certainly an inside 50 opportunity for the Jets. Dojiok was dominant in the first half on return, showcasing her clean hands and presence around the ball off half back and causing the Jets to rethink their movement into their forward 50. Dropped a big mark inside 50 in the second quarter, but took on the ground ball with a second try at the footy, earning a ball up for her efforts and causing chaos for the Jets. Dojiok showcased her ability to read the play well defensively but needs some work moving back into attack. Some iffy decisions when it came to kicking off half-back into the forward line saw her not always kick to the advantage of teammates, meaning some forward opportunities for the Rebels turned to grappling for the ground ball. Did not take part in a chunk of the second half after limping off midway through the third term and did not take the field to start the final quarter, but eventually came back on at full forward. Morris-Dalton just always seems to find the goals and this game was no different as the forward contributed two majors. Her vision and execution by foot up the ground was pleasing to see, but Morris-Dalton’s best traits come out inside 50 as her anticipation, positioning and goal sense all helped her snare her goals. An opportunist, Morris-Dalton’s clever dribble goal through a bit of traffic in the fourth term was the better of the two. Positioned mostly on the wing, Fitzgerald comes in and out of the game with exciting passages of play, hitting the ball at speed and delivering it inside 50. Her break and pass to Ellie McKenzie in the second term was impressive, and Fitzgerald is one of the better movers in a stacked Northern side. She shows glimpses, but Fitzgerald can sharpen up her finish product in front of goal to make her a more complete and damaging outside player. McKenzie is such a classy player, and showed her best traits when it mattered for Northern. While she was caught holding the ball early on, McKenzie bounced back well in her customary deep forward position, snapping a classy goal on her stronger left foot and taking an impressive one-on-one overhead mark to slot another goal in the second term. McKenzie’s evasiveness while looking for options up the field was great to watch, as she summed up all the options ahead of her and used the ball cleverly going forward. Her kick to Britney Gutknecht deep inside 50 was a prime example of that, but McKenzie arguably works best as the deepest forward – highlighted by how she worked her opponent under the ball in the final term and almost snared her third. A reliable target, McKenzie looks to be converting her skills well to playing further up the ground. Tried again in the midfield, Gutknecht was clean early on but showed the most when she lifted after quarter time. She looked to get on the move more at stoppages, winning a clearance which led to goals from Nell Morris-Dalton and Mia Papachristos. She chimed in with a goal in the third term while resting deep forward, but was thrown back into the midfield with the game in the balance and really stood up alongside Northern’s prime movers to seal the win. While her possessions are damaging, Gutknecht also hurt Eastern with her second efforts and tackling, with a key one on Ranges star Tarni Brown capping off a good day. Newton is an out-and-out star, and seemed to be everywhere for Northern. She started well with the first clearance of the game, following up well to accumulate over the first term. A mark overhead from the kickout in the same quarter was impressive, as was her ability to keep her hands up and flick out handballs around stoppages. Perhaps the most impressive of Newton’s traits proved to be her leadership, with the Knights skipper standing up well in the second half to help her side get over the line. Spending time in the ruck, Newton palmed down well to find Britney Gutknecht on one occasion and has an unbelievable leap, but also looked more like a fourth midfielder at the centre bounces which was invaluable. A crazy good prospect, Newton’s versatility and skill makes her a close to complete player. While she is not as consistent a ball-winner, Snow was a terrific competitor throughout the day and fought hard from defence. While Snow looked to have bitten of more than she could chew as she was caught by Tarni Brown early on after an attempted ‘don’t argue’, she continued to take the game on and drive the Knights forward. Snow’s burst and second efforts were important to the team’s cause, with her competitiveness an attack on the ball making her a valuable team player. Meagher is a zippy type in the midfield and did well to find space around the ground. Buzzing around her opponents with good speed, Meagher is hard to miss under her helmet and her opponents clearly looked for her in open areas. Meagher often picked up the scraps well and found the ball inside 50 having spent some time in attack in the third term. Brown was one of Eastern’s best as its second-highest possession earner. A smooth mover through midfield, Brown looked every bit the natural footballer as her pedigree would suggest, while also showing smarts in her positioning. Brown’s tenacity and willingness to work hard for her disposals was good to see, but was still secondary to her class on the ball. Brown’s awareness in traffic and evasion really aided her clearance game on the weekend, and she should get Collingwood supporters excited as a potential father-daughter selection. McClelland did not win huge amounts of the ball, but was dangerous when she found it. Spending the bulk of her time up forward, McClelland was a good presence around the forward 50 arc and was one who really attracted the ball as it came in long. While she seemed to fade out of the game late, the Ranges co-captain has something about her and catches the eye when around the goals. A prolific netballer, Gibbs was tried as a key forward and in the ruck – showing glimpses of skill conversion throughout the day. She took a nice overhead mark and looked to have judged the ball well when sitting under high kicks. As Gibbs grew into the game, she won a handy clearance from the ruck late on, and could have snared a goal with her set shot in the third term. Remained prolific in the loss, delivering the ball effectively inside 50 and rebounding well down back. Her impact dwindled slightly from previous weeks, but she made good use of the footy and continued to utilise her supreme kicking ability. For the day she had 13 disposals, 11 kicks, four marks, four tackles, two rebounds and five inside 50s. Shannon was arguably Dandenong’s most impactful player, zoning off well in defence and charging clean at the loose ball. She was remarkably effective at gathering the ground ball given her height and approaches her opponents with confidence, rewarded for two strong tackles in defence and ripping the ball from an opponent’s hands inside 50. Her ability to gather off Dandenong’s backline created opportunities going forward and caught plenty Geelong Falcons midfielders out of position. She finished with 13 disposals, 11 kicks, two marks, six tackles and two inside 50s. Smith brought a real fighting spirit to the Dandenong midfield when the game started slipping from their grasp. She gathered well out of the stoppage and found space in congestion. As with last week (seven inside 50s), Smith remained pivotal in the centre, repeatedly sending the ball inside 50. In the third she was awarded a free kick after following up her smothered kick with a tackle, taking back some momentum for her side. She finished with 17 disposals, four tackles and four inside 50s. Stood up well defensively despite a three-quarter onslaught from the Falcons. Exited well up the guts and picked her targets well. Proved reliable by foot, finishing with 11 disposals, eight kicks and two rebound 50s. Alongside Tierney, Sheppard completely tore up the midfield, attacking the hard ball and breaking free from congestion. She kicked the first goal of the fourth to further their lead and led the game in inside 50s (seven). She earned two free kicks for her efforts and tied with Tierney for a game-high 22 disposals. She also accumulated two marks, seven tackles and two rebounds. Moloney remained a tough utility for the Falcons, standing up in the win. Brought repeat efforts to the contest and cleared well from the stoppage. She was dropped in a hard tackle midway through the fourth but returned for a third effort following the head knock, assisting the footy clear. Works hard on the inside and looks comfortable in front of goals. Moloney finished with Falcon’s first goal, 18 disposals, three marks and two inside 50s. Fought hard for the contest and worked her opponent on the ball. Found a lot of the footy and was one of Geelong’s better users for the day. She kicked a goal to open the third, putting her team within five points and delivered the ball well to her forwards. She had 11 disposals on the day, nine kicks, three marks, five tackles and five inside 50s. A good worker on the inside, McEvoy finds the contested ball well and delivers well by hand and foot. She worked the ball carrier well and had her efforts rewarded with six strong tackles and finished among the top three for disposals (20). She also finished with three marks and four inside 50s. A powerhouse with the football, Tierney finished one of the most impactful players across both sides. Strong overhead and a good mover with the ball. She delivered well by foot and kicked the goal which put them in front for the first time in the third quarter, seeming impossible to contain once their lead increased. She also had a game-high 22 disposals with 16 kicks, seven marks, three tackles and three inside 50s. WITH Round 4 of the NAB League Girls complete the Geelong Falcons have continued their winning streak while the Northern Knights have moved into second spot on the ladder after a convincing victory over Sandringham. Up the other end of the table the Jets, Dragons and Power are yet to win a game. Northern: N. Morris-Dalton 2, B. Gutknecht, E. McKenzie, M. Papachristos. Northern Knights remain undefeated in 2019 after an impressive 21-point win over Sandringham Dragons to open the round. After a tight first half under intermittent rain, the Knights could only manage a nine-point buffer at the main break, but broke the game open as prime movers Britney Gutknecht and Ellie McKenzie stood up to hit the scoreboard. Nell Morris-Dalton was another to score in the third term, putting through her second to be the Knights’ only multiple goal kicker, while Sophia Rothfield booted both of the Dragons’ majors. While Gabby Newton was the prime ball-winner for Northern on top of McKenzie and Gutknecht, Winnie Laing and Alice Burke were constants in the engine room for Sandringham and tried hard all day. Bottom-ager Sarah Hartwig was also important for the Dragons having played at both ends, and took a couple of important intercept marks while in defence. With two wins on the trot after a draw to Oakleigh, the Knights moves on to another clash at La Trobe University with the 3-1 Eastern Ranges, who are coming off a big win over Western. Meanwhile, Sandringham faces a tough task to back up this one, set to do battle with Oakleigh at home on Saturday. Bendigo: A. Strahan, E. Gretgrix, J. Jolliffe. Bendigo Pioneers balanced their season ledger with a terrific 14-point win over Murray Bushrangers at Deakin Reserve in Shepparton on Saturday, The Pioneers booted the first goal of the game through captain, Eloise Gretgrix, but it was a tough struggle after that as both teams refused to give an inch. The Bushrangers got on the board through Emilee McPherson in the third term. It wasn’t until the final term when Annabel Strahan and Jordyn Jolliffe put the final nails in the coffin to see the visitors hold Murray scoreless and take home an important four points. Strahan was terrific, picking up more disposals (20) in the game than she had in her first three, while also laying seven tackles, having five inside 50s, two rebounds and booted that all important second goal. Brooke Hards was strong again with a game-high 11 tackles as well as 17 disposals, three marks, four inside 50s and three rebounds. Maeve Tupper was prominent in the midfield with 16 disposals, while up either end, Jolliffe and Kate Douglass were solid. For the Bushrangers, Millie Brown had her best game of the season with a game-high 27 touches as well as two marks, while Abby Favell had another 22 disposals and eight tackles. Mindy Quade and Hayley Doohan were named among the Bushrangers’ best in the defeat. Eastern: S. Gibbs 2, L. McClelland 2, R. Hall, J. Richardson. It was a close start but in the end, it was the Eastern Ranges who pulled away in the third term kicking three goals to the Jets one point. The Ranges seemed to look more composed with ball in hand and hit up targets across the field, while the Jets had moments of brilliance but they were unable to sustain a four-quarter performance. Elisabeth Georgostathis impressed once again for the Jets but was down on her usual standards. Teammates Ruby Tripodi and Stephanie Asciak were dominant with their timely touches and smooth movement across the ground. While for the Ranges Laura McClelland proved to be hard to stop both in front of goals and across the ground. McClelland nailed two majors while teammate Serena Gibbs also chimed in with two majors to her name. Olivia Meagher also impressed for the Ranges going in hard at the contest and putting her body on the line more than once throughout the game. Geelong: M. Skinner 2, P. Schaap, D. Moloney. Geelong Falcons took another scalp on their journey towards back-to-back Premierships, defeating the GWV Rebels at City Oval in Ballarat on Saturday. In cold and wet conditions, the Rebels took it up to the Falcons who had the wind in the first quarter. Neither side could kick a goal in the first quarter, and the Rebels took a surprising one-point lead into the first break. The second quarter was wildly frustrating for the Falcons girls, as they simply couldn’t convert on a plethora of opportunities. The Falcons missed five opportunities that should have been kicked, including a magical piece of play from Lucy McEvoy where she turned her opponent inside out, and hit the post from point blank range. At half-time, the Falcons had kicked 1.9 and the Rebels were still in the game. Falcons coach Jason Armistead was fantastic at half-time, reminding the Falcons girls that the game was a four quarter game, and used a finance analogy that “interest accumulates” and to continue to invest in the team and that they will be rewarded like millionaires. Armistead was right, and the Falcons girls looked like millionaires in the third term, absolutely dominating the game. The Falcons did not allow the Rebels one inside 50 in the third term. Rebels coach Rhys Cahir tried desperately to spark his young Rebels into action in the final term, urging them that “team football is your way back into this game”. Captain Sophie Molan did what all good captains should do, putting into action the coaches demands with an outstanding chase down tackle at the start of the final term. Unfortunately, for the Rebels, the Falcons were far too good, and when Mia Skinner kicked a nice goal off a turnover in the third minute, the game was all but over. The Falcons winners by 36 points, 4.17.41 to 0.5.5. Despite his side not kicking a goal, Cahir stated that it was the best four quarter performance for effort he has seen this season from his side. “They just won some cleaner footy, and when the scoreboard pressure came, we struggled to get back into it,” he said. The Rebels will hope to bounce back next week against the Western Jets, while the Falcons look to maintain their impressive form against the Stingrays. Gippsland: C. Turner, J. Chila, M. Fitzsimon, M. Gilmour. Dandenong: G. Howes 2, C. Bell, T. Smith, L. Grocock, S. Stratton. Dandenong Stingrays made it three consecutive wins after seeing off a late Gippsland Power challenge to record a 22-point victory at Morwell Recreation Reserve. In challenging conditions, Georgia Howes kicked the first two goals of the game, before Shaneece Stratton made it three and the Stingrays were off and away. Jaime Chila pulled the margin back with her first goal for the Power, but a couple more majors in the third term to Caitlin Bell and Lucy Grocock saw the margin out to 35 points by the final break. When Tyanna Smith converted in the third minute of the final term, the Stingrays led by 41 points. To the Power’s credit, they never stopped fighting and made the margin respectable thanks to goals from Macie Gilmour, Chloe Turner and Megan Fitzsimon. The Stingrays were terrific throughout, with Amie Carroll named their best, while Brooke Vernon‘s phenomenal season continued with a strong performance in defence. Full-back Zoe Hill and bottom-age midfielder Tyanna Smith were again named in the best, while Isabella Shannon had a team-high 17 disposals. For the Power, Fitzsimon backed up her effort last week with an even better performance on Saturday, collecting 26 disposals, five marks, four tackles, six inside 50s, five rebounds and a goal. Captain Maddison Shaw was again impressive in defence with six rebounds to go with 17 disposals, while Chandra Abrahams also stood tall in the win. Calder: T. Gillard 2, A. Magri, F. Theodore, G. Elarmaly. Oakleigh: E. Harley 2, T. Morton, A. van Oosterwijck, M. Bertuna, G. Lagioia, K. Kearns. Oakleigh Chargers handed Calder Cannons their first defeat of the season, with a strong 10-point victory in wet conditions up at RAMS Arena. The Cannons came into the match without dropping any points thus far this season, but Oakleigh looked prepared from the first bounce, holding the Cannons scoreless in the opening term, and by the 13th minute, led 4.1 (25) to 0.1 (1) and it was beginning to look like a one-sided contest. Emily Harley had already converted two goals and looked the dominant goalkicker on the ground. Gloria Elarmaly finally got the Cannons on the board and when Alisa Magri converted early in the third term, the margin was back to 11 points. The Chargers booted the next two goals of the game to give themselves some breathing space before Tahlia Gillard found the big sticks with 21 seconds remaining in the term to give the home side some hope heading into the final break. Just 96 seconds into the final term, Gillard made it two consecutive goals and when Felicity Theodore added another at the six and a half minute mark, the deficit was just six points and it looked like all the momentum was with the Cannons. Amelia Van Oosterwijck settled for the Cannons to five them a two-goal buffer, as a couple of missed opportunities late for Calder meant the Cannons fell short of a fourth consecutive victory. Gemma Lagioia had a team-high 21 disposals and a goal, while Van Oosterwijck was named Oakleigh’s best for her pressure work and match-winning goal. Harley’s attack up forward to set the game up with two majors as well as 14 disposals and five marks was solid, while Mimi Hill and Nicola Xenos both had 17 touches in continued good form. For the Cannons, Emelia Yassir had a team-high 14 disposals and was named in the Cannons’ best, while Alana Barba and Kasey Lennox were also among their side’s top players in the loss. WE attended five of the six NAB League Girls games, taking a look at some of the players raised by respective Female Talent Managers at the start of the season as those to watch. All notes are the opinion of the individual writer. Impressed in the midfield working hard at the coalface for contested ball, and was winning a number of clearances. She had a consistent effort across the four quarters, and while it was not a flashy game, McNamara played her role, and along with Winnie Laing got the ball out to the Dragons runners on the outside. The standout key defender on the ground, Hartwig impressed once again with her closing speed and one-on-one ability. She laid a huge tackle in the first quarter, blindsiding her opponent and earning a free, while constantly competing in the air or at ground level. She is able to dispose of the ball laterally and had no problems putting her body on the line when required. Hartwig took a great flying intercept mark in the defensive 50 and earned a 50m penalty for her troubles, then took another great intercept mark at top speed going back with the flight in the final term. The potential St Kilda father-daughter prospect had a terrific game throughout the four quarters, having her usual impact on the contest. What was particularly impressive was her defensive work, laying multiple tackles on opponents to cause turnovers or stoppages at crucial points in the game. In one instance she tackled Georgia Patrikios, forced a spilled ball and backed up by tackling Georgie Prespakis straight after. She put her body on the line and while sometimes she gave away free kicks due to her fierce nature, she continued to work hard, putting a perfect low darting ball inside 50 late in the game. Burke had a chance to goal from a tight angle on the boundary line in the third term, after a clean pick-up, but just missed. Overall a really promising performance in the midfield. Similar to McNamara, Laing worked hard around the stoppages and constantly dived on the ball and shovelled it out to teammates. While at times she can rush her disposals, Laing’s ability to extract the ball from a tight situation and get it forward to dangerous positions was quite noticeable. In one instant she got the ball forward to a teammate who won a free from a marking contest, but was unfortunately unable to convert the set shot. Worked well on a wing, and although her kicking at times was a little erratic, she was able to get into space and impress with her ability to move the ball. She took a number of intercept marks in midfield and showed good speed out of a stoppage to kick it forward. Had a strong first half before a quieter second half. Had her moments throughout the middle of the match, using her smarts to paddle the ball in front of her in the second term to keep the play alive before giving it off to Georgia Patrikios with a quick handball. She caused a free against her when running hard forward which was unlucky, but the moment her team won back possession she took off showing her high work rate. Her pressure in the forward 50 allowed the ball to spill from a tackle and for teammate Neve Crowley to boot a goal. Always involved, Patrikios had a mixed bag of a day. Her clean hands and ability to sidestep opponents and seemingly make time still was evident, but she uncharacteristically missed her targets by foot at times. She still had plenty of impressive passages of play however, hitting up Krstel Petrevski on the wing in the second term, and was crucial in setting up some plays late in the game, combining well with Georgie Prespakis and Felicity Theodore inside 50 to create scoring opportunities. One of the more impressive players in the win, Petrevski was really prominent early, kicking out of congestion to put it to Makeisha Muller‘s advantage in the first half. She pumped it in deep in the first half, and also showed quick hands out of congestion. On a number of occasions she kicked to an area where it advantaged her forwards and troubled the opposition defence. Petrevski has shown signs at times this season, but the Round 3 clash was her most consistent across four quarters thus far. The exciting bottom-ager spent time in midfield and defence, and was one of the biggest ball winners on the day. She showed quick thinking on the inside with slick hands, often shovelling the ball out to the likes of Georgia Patrikios. When going forward, she set up Gloria Elarmaly for a shot on goal which was unfortunately missed. She had her own chance on goal earlier in the game, and then a late set shot, but missed both opportunities. When coming out of defence, she was able to run and carry and use good skills to kick the ball forward. Tough as nails. Got cleaned up on the wing with an awful high hip and shoulder, but got straight back up and kept on going. Relatively quiet game for her lofty standards, but was still able to get numerous inside 50s to put pressure on the Stingray’s defence. She is really tough and puts her head over the ball showing she is not afraid to go in hard at the stoppages. Wood was the Rebels best midfielder, and proved that she is a contested ball winner. She showcased her football smarts throughout the game with some clever passages of play. Some of her work in the first term set her apart from the others on the field, simply due to her ability to read the play better than her opponents and teammates. It was a true captains performance, she could not have done more. Moved forward in the second quarter and looked to have single handledly brought her side back into the game. Crunched her opponent with a huge tackle in the goal square two minutes into the second quarter and converted from that opportunity, she followed that effort up minutes later with a nice set shot. Molan moved back once the Rebels started struggling, yet was still working desperately to drag her side back into it. She worked tirelessly throughout the game to win the ball and move into good positions across the ground to create opportunities proving her value to the side. Had a really good first half. Her athletic ability is fantastic seeing as though she is quite tall, and proved with the amount of touches she got in the first half that she has plenty of ability. A brain fade at the end of the second quarter really hurt her confidence, and she found the second half a little more challenging not seeing the footy as well but still tried hard throughout the match. difficult. Simmons showed she has a lot of potential and with more development and exposure could be a valuable player for the Rebels. McDonald has a booming kick. In the second quarter, she took the centre clearance, strolled out and launched from about 50. The wind got hold of it and it just faded, but it could have been goal of the year credit to her ability to strike the ball with precision. McDonald kicked 2.3 and probably had the opportunity to kick a bag of four if she was able to convert all her shots at goal. Her volley goal from the goal square sealed the Stingrays victory proving her footy smarts. Classy player. Shannon played in many positions all over the ground, and was outstanding throughout racking up plenty of touches. She kicked a nice goal after the Rebels turned the ball over, and she finished well. Nice set shot on goal in the third and seemed to have a hand in most of the Stingrays goals in some way credit to her attacking style of play and ability to go in hard at the contest. Smith had so many highlights, but her best one was a silky pickup on the wing, a bounce and a long bomb to the Rebels forward 50. She had an impact all over the ground with her clean hands, quick handballs and applied plenty of pressure laying some good strong tackles. She is proving to be a talented player for Dandenong and with further game time she could develop into an even more valuable asset for her side. Bannan displayed her good hands under pressure with clean pick-ups and a beautiful strong grab in the goal square. Her ability to read the flight of the ball allowed her to nail a good goal in the first quarter as she could get into a good scoring position and read the drop of the ball. She impressed with her good quick hands and pushed forward to create a real presence in the forward 50. Used her kicking ability to bomb it long inside the Knights attacking half and showcased her ability to hit up a target. Bannan provided a good contest in the air and with the wind behind her in the last quarter she kicked an impressive goal from about 40m out after a beautiful lead through the middle of the 50. Sansonetti used her good strong kick of the footy to propel the ball out of their defensive 50. She used the ball well by foot and had good hands in close. She was not afraid to put her body on the line, laying a strong tackle to bring down her opponent. She tracked the ball well and pushed into the midfield at times, using her strength to shrug off tackles and dish off handballs. McKenzie impressed with her good evasive skills, shrugging off a big tackle in the first and keeping her hands free finishing off with a good handball. She showed good spatial awareness, broke through the packs at the centre bounce and pushed forward to try and create scoring opportunities for the Knights. Even when she fumbled she recovered well, got to her feet and hit up a target showcasing her footy smarts and composure. She applied a good smother and agility to pick up the ball and dish it off out of the congestion. McKenzie highlighted her speed with a good run and bounce through the middle of the ground but will be disappointed she was unable to finish off the good piece of play. She worked hard all game both in attack and defence, opening up the middle of the ground with a good pick up and precise kick into the 50. McKenzie continued to find space throughout the game and used the footy well, creating plenty of forward thrusts for the Knights. The midfielder displayed her beautiful strong hands and was clean at the stoppages, able to extract the footy with ease throughout the game. She kicked an impressive long goal from about 40 out off a step going right through the middle. Gutknecht applied a strong tackle to bring her opponent to ground and trap the footy in and showed good attack on the footy. She impressed with her ability to read the flight of the ball and rode the tackles well to keep her arms free and dish off a handball. She worked hard to get in and under at the stoppages and moved into good positions around the stoppages to be that release player for the Knights. Newton impressed from the get-go racking up plenty of touches and using her footy smarts to impact the play across the ground. She attacked the footy hard and tracked the ball well at ground level. She was clean at the stoppages, composed under pressure and showed good control of the footy to hit up teammates. Newton applied her fair share of strong tackles and displayed her impressive vision to kick to a moving target. She was good off hands, read the play well, attacked the footy and impressed with her ability to read the play and get it out of congestion. The midfielder was never far from the contest and proved she was not afraid to put her body on the line, roving exceptionally well around the ball ups and reading the taps really well. She worked hard in defence as well, getting hands to ball and contesting the footy, ran hard all game and kept presenting to be an option across the ground. Grant showcased her good hands in close and read the play well moving into strong positions across the ground. At the stoppages she flicked the ball out to her teammates and worked tirelessly to get in and win the footy. She showcased her clean hands and booming kick to help move the ball forward for the Jets. Georgostathis attacked the ball hard and impressed with her speed across the ground. She showcased her spatial awareness to dodge players and pass off the footy with her clean hands. She highlighted her beautiful kick of the ball and worked hard in attack using her body well to out position her opponents. She competed well in the air and if she did not mark the ball she brought the ball to ground and followed up her work. Georgostathis roved the packs well and worked tirelessly all game to try and win the footy for the Jets using her quick hands and beautiful kick of the footy to find a teammate under pressure. She is a good long kick of the footy and showcased her strong hands in the contest, taking a big grab in the middle of the ground in the third quarter. Pritchard got involved across the ground, put her body on the line and was solid in the ruck winning a few taps to the advantage of her teammates. Her follow up work was impressive and used her long kick to help move the Jets forward. Saxon-Jones showcased her kicking ability with a long piercing kick into the forward 50. She displayed her strong hands taking a couple of big marks. Saxon-Jones impressed with her quick hands and good footy smarts to dish off a handball to a teammate in a better position. When in the ruck she won a few taps and read the flight of the ball well. The diminutive forward returned for another outstanding display of forward pressure and nous around goal, buzzing around the Falcons’ 50 to make a solid impact on proceedings. Her ability to bring the ball up from ground level is invaluable, and combined with her tackling often presents Geelong with scoring opportunities. Vella booted the only goal of the third term on the back of some slick twists and turns, but was influential throughout the day. Arguably her side’s best, Gardiner looked slick from the get-go with some smooth side-steps and a knack for taking opponents on successfully. She showed her ability to break away from opponents with strong bursts, and pushed her side forward with real intent across the game. Gardiner’s running ability also allowed her to find space in the forward half and create clear-cut chances, much like the passage for Renee Tierney’s second quarter goal. A particular highlight was her sensational intercept mark in the third term, capping a ripping performance. Moloney cracked in hard and showed a willingness for the contest – both at ground level and with an impressive second quarter overhead mark. She has a good leap which boded well for her aerial impact, and often kicked long to be one of many Falcons to provide some serious drive. Moloney’s smother in the fourth quarter was a fitting finish to a hard-fought shift. Chapman did not have much to do in the first three quarters, but was solid as usual at full-back when the ball came her way. Pressing off from deep in defensive 50, Chapman did well to cut off many of Bendigo’s forward forays and push the ball back the other way, making her a key part of keeping Bendigo goalless for three quarters. She went forward in the closing term and bagged a goal deep inside 50, while also leading up well in that time. The dangerous forward went one better on her three-goal effort last time out, snagging her fourth goal in the final term to cap off an exciting display of offence. Employed both deep and in her usual high half forward role, Skinner made good use of quick-fire opportunities to snap on goal and was clinical in her finishing for the most part. She just seems to find space so easily and is always in the contest when the ball arrives in Geelong’s attacking half. While the skipper was followed almost everywhere by Bendigo’s Brooke Hards, she still managed to find a heap of the ball in all areas of the ground. Starting at the first centre bounce, McEvoy looked on track to continue her good form in midfield, but did not quite have the same damaging effect with her disposals. Many of her better touches were handballs from in-close and she found teammates often, which has been a pleasing feature of her game. She later moved forward, and then seemed to cover for Abbey Chapman down back later on and was solid. While she still managed to hit the scoreboard, Tierney was made to earn it throughout the day by star Bendigo defender Katie Douglass. She showed good signs at ground level and looked better when working into space on leads, rather than competing one-on-one. Still, her goal came from a mark deep inside the 50 in the second term, and she provided a nice assist to Laura Ryan later on to see out her game. Started off in her usual midfield position and provided some good tackling presence. An early tackle on Lucy McEvoy was a sign of things to come, as Hards competed well with the Geelong skipper at most contests, while also following her to both ends of the ground. Hards was still able to showcase her dash from stoppages and won some eye-catching clearances while zipping around the packs. Was named Bendigo’s best for the day. The Pioneers captain joined Hards in the midfield as expected and competed hard to set the tone for her side. She is not afraid to crack in at the stoppages, and showed her competitiveness in the third quarter with some tough efforts. Also showed strong hands against two opponents in the second when Bendigo were under the pump. Despite the Pioneers leaking nine goals, Douglass was a star down back all day and had some ultra impressive moments. Matched against Renee Tierney deep in defence for most of the day, Douglass reeled in some fantastic one-on-one marks under pressure, while also staying composed in traffic when moving the ball out with her booming left foot. She pushed hard at the ball when it came in at ground level, while also affecting spoils and smothers when the ball was otherwise in dispute. A good shift from the defender overall on a tough day for the Pios. While Slender struggled at times to hold a rampant Geelong side at bay, she looked to improve in the second half with a couple of really nice overhead marks and intercepts. That is clearly a key part of her game, and is usually an eye-catching feature of her back-half partnership with Katie Douglass. Slender has plenty of time to work on her promising traits too, set for another two years in the NAB League system. The over-ager started up forward and took a nice one-on-one mark early on. Not afraid to use her body in the contest, Jolliffe tried to burst away with the ball and was even employed at times at the centre bounces. She made good on that move too with a couple of clearances. A prominent midfielder on the day, the noticeable trait about Favell is her ability to somehow find space around the ground. She would often take an uncontested mark after working hard to push into open space, and then kick long inside 50. As a whole she was reliable by hand or foot and also worked hard back into defence on occasions and was able to find the ball. Overall, she was one of the more prominent players on the day and in a match without standouts, a lot of the Bushrangers shared the load and she was one of those who stood tall in the win. Just did her thing around the ground and contributed through the midfield. She won a fair chunk of contested ball, and got involved early with some important touches. Brown was able to display good core strength to dispose of the ball while being tackled, and she moved well through traffic to dish off to teammates. Another Bushrangers midfielder who shared the load around, and was best on the defensive side of things, laying a number of big tackles on opponents to stop them in their tracks. Locke is strong one-on-one and gained distance going forward. Putting together a few solid performances thus far this season, and provided some strong inside ability for the Bushrangers against Gippsland. The Bushrangers’ best player on the day, Barber could have had a real day out in front of goal had she not missed a couple opportunities. But in the first half she looked the most damaging on the field, and then was rewarded for her hard work in the second half by converting a couple of goals to seal the win. Barber continually presented at the ball, and would more often than not mark the ball, or if not, bring it to ground. She showed what she was capable of with her leading and marking, and will be one to watch over the course of the next two seasons. Abrahams contested strongly around the ground, playing through the midfield and always providing a target for defenders to kick to. She went up for a series of marks, and while she couldn’t bring one down, was providing an aerial contest to force opponents to go with her. At ground level, she was fierce with her tackling, defensive pressure and one percenters, indirectly forcing some turnovers. Abrahams also had a desperate smothering attempt in the first term and a great smother in the second term. While statistically her numbers would not be huge, the work she did off the ball was what was impressive. One of a number of Gippsland defenders who stood tall in defeat, constantly stemming the flow and rebounding the ball out of the back half. Shaw showed great leadership off half-back and was able to dispose of the ball by foot under pressure, getting it out of the danger zone and up to the wing. When required, Shaw pushed up the ground to add an extra number to the contest and copped a foot to the face in the third term but shook it off to continue and continued to be involved in the play. A quieter game from Webber, but she still showed patches of strong play, laying a number of tackles and pushing up the ground to bomb the ball long inside 50. She pushed up the ground to help out her teammates, and missed a shot on goal in the third term. Took a couple of strong marks around the ground as well. 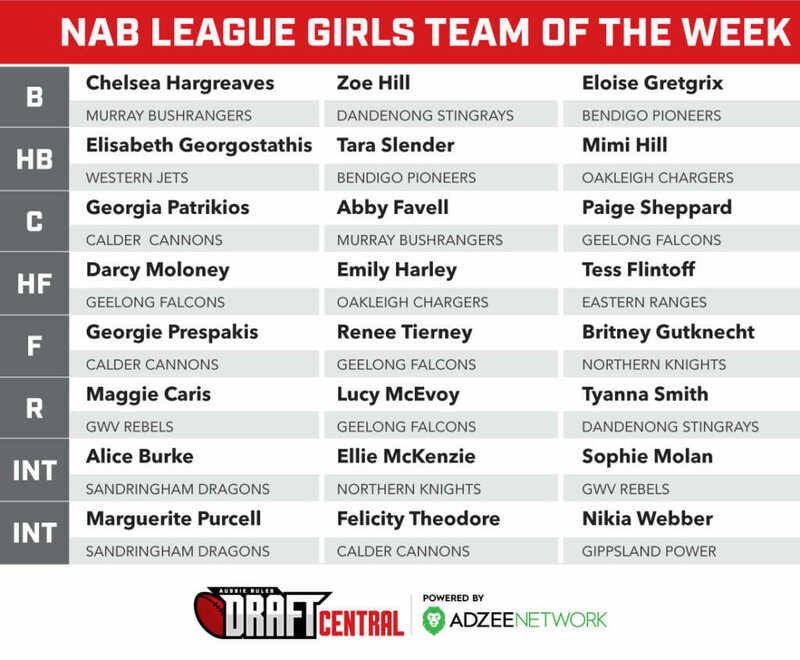 GEELONG Falcons’ dominant performance in Round 2 of the NAB League Girls competition has earned them the most nominations for Draft Central’s Team of the Week in an even round across the board. While the Falcons had four players in the team, Calder Cannons were not far behind with three. Of the remaining 10 teams, seven had two nominees, while Eastern Ranges, Gippsland Power and Western Jets had the one player make the side after Round 2 losses. The reigning premiers were impressive in the forward half, and both Darcy Moloney and Renee Tierney fit into the forward 50, while Paige Sheppard slots onto a wing and Lucy McEvoy has been named on the ball. For Calder, Georgia Patrikios returned to the side and has been named on the other wing, while Georgie Prespakis booted a record seven goals up forward, and Felicity Theodore was energetic throughout the second half. Speaking of record goal hauls, one of only three other players to hold the seven-goal game record is Northern Knights’ Britney Gutknecht who is in the opposite pocket, while Ellie McKenzie’s two goals – including the all-important match winner – saw her fit into the side. Emily Harley returns to the side for Round 2, joining Tierney in the key position spot inside 50, also in the side with Chargers’ captain Mimi Hill who was impressive on the weekend. Bendigo Pioneers had their first win and Tara Slender had an equal round-high seven rebounds to lock into the key defensive spot, along with Eloise Gretgrix who made the team once again, in a back pocket considering her influence in the defensive half of the ground. Also in defence despite mostly playing as a midfielder is Elisabeth Georgostathis, purely for the fact she had the equal round-high seven rebounds showing her work rate back into defence. In the other small defender position is Chelsea Hargreaves, who with centre Abby Favell became the first Murray players in Team of the Week for the season after impressive performances. Dandenong’s Zoe Hill again fills out full-back, this time joined in the team by bottom-age midfielder Tyanna Smith who was one of the Stingrays’ best in their win over Sandringham. The Dragons also had two players in the side, with Marguerite Purcell and Alice Burke both on the interchange after solid games through the midfield. The other side with two players in the team is the Greater Western Victoria (GWV) Rebels, as Sophie Molan worked tirelessly through the middle, and Maggie Caris was dominant in the ruck. The two remaining players in the side are their respective team’s representatives in Tess Flintoff (Eastern Ranges) and Nikia Webber (Gippsland Power). ROUND 2 of the NAB League Girls competition played out on the weekend, and we were at four of the six games taking a look at the players highlighted by respective talent managers as ones to watch throughout the season and beyond. For the two games we did not get to, we recapped how some of the players performed statistically for the sides. Started in attack opposed to Georgie Prespakis, and kicked a great goal in the last minute of the term. She showed great game smarts to toe tap the ball to her advantage, then get the right spin on it to kick it off the ground, and for it to dribble around the goal post for the Rebels’ first major of the day, from a tight angle. Saulitis pushed further up the ground as the game went on and played through the midfield, even winning possession at half-back and kicking cleanly to the wing. She did get bumped off the ball a little too easy in a marking contest, but once the ball hits the ground, she is in her element. Impressive game through the midfield, especially early on when the game was even. Her kicking inside 50 was very solid and set up Renee Saulitis for a mark, and continued to relentlessly attack the ball throughout the match. In the second term she had two instances of great courage where she flew back into a marking contest, then if she got knocked down, got straight up again. She worked hard around the ground and presented as an option from kick-ins, and a perfect representation of her second efforts was when her kick was smothered in defence, she followed up to lay a tackle on her opponent and force a throw-in. A big game for the tireless leader who had the ball on a string for a lot of hte day. Her clearance work in particular stood out, and she won a number of free kicks for being held around the stoppages. Molan spent time at full-forward, but was most effective when in the middle extracting the ball from the coal face. She regularly put her body on the line and moved well in tight, showing great vision and football IQ in one instance to handball clear to a teammate while under pressure. Her second efrorrts in attack saw her lay a big tackle, win a free kick for holding the ball then Molan played on and kicked a great goal. A promising game from the developing ruck, who won a bit of the football around the ground as well as dominating in the ruck. She won countless hitouts, and was able to extract a ball from traffic inside 50 and kick it deep in the forward line. Caris’ standout feature is her clean hitout ability, able to get a full hand to the ball such is her height and leap ability over her opponents. A terrific game from the Cannons mid/forward who just got better as the game went on. While Georgie Prespakis’ name was the one to be thrown around for her seven goals, Theodore was the clear second best with some huge efforts, including multiple goal assists to Prespakis, and kicking a goal of her own. She had other chances as well but just missed out on converting late in the game. The piece of play that best exemplified her impact was where she won the ball inside 50 in the third term, but insitead of blazing away and only looking for the goals, lowered the eyes and put it to Prespakis’ advantage. She combined immediately after with a similar play, bursting out of a stoppage to pop it up above Prespakis who marked and goaled again. Back into the team after Round 1, Patrikios was used sparingly early, starting on the bench in the first and second terms, and then rotating across the ground on the grandstand side. She played on the outside to use her skills to advantage. Patrikios has that ability to make time stop and can turn opponents inside out and seemingly casually side step them without too much trouble. Her vision and skill execution was impressive and came as no surprise, and with a game under her belt, she will be better going forward. Seven goals in the second half, a match winning performance. There is not much you can say about her performance other than dominance when at full-forward. She is strong and clean in the air, quick at ground level and has an innate goal sense when to go and when to pass. She remarkably started in defence on Renee Saulitis in the first term, moved into the middle in the second, then played out of the goalsquare in the last half. Prespakis has a powerful kick and once she has front position in a marking contest, it is hard to stop her. Of her seven goals, most came from set shots, but she produced a few tricks, including one where she was being dragged down by a couple of opponents and she managed to get a kick away between a couple more for it to go in, as well as her next one where she was corralled into the boundary, but had the speed to take on her opponent run around and kick into the open goal. Prespakis had a couple of opportunities late in the game to break the record and kick a couple more goals, but seeing her teammates with the ball were in better positions, she just pointed to the goals and let her teammates get on the board. Bannan showed a good ability to get boot to ball and helped to propel the footy forward on multiple occasions throughout the game. She worked hard at the stoppages and displayed her strong marking ability in the 50. She provided plenty of good leads and opened up space. She impressed in one passage of play where she was taken in a tackle and stood strong while getting dragged down to throw the ball on her boot and kick into the Knights forward 50. She protected the drop of the ball and showcased her good footy smarts to read the play and get into a good position. Kicked a good goal in the third after breaking away from the pack and nailing the shot. Sansonetti proved that she could read the flight of the ball well and contested hard in the air. She showed good attack on the footy and worked hard throughout the game to get to the contest and compete. Her tackling pressure was second to none bringing players to ground and hunting them to win the footy. She also displayed good spatial awareness to kick the ball into space and move the ball out of defence to a more attacking position for her side. She applied plenty of good strong tackles and chased hard throughout the game to try and win the ball back for her side. McKenzie attacked the footy hard and dished it off with clever passes to teammates in better positions. She showcased her strong marking skills and ability to read the play. McKenzie impressed in the last quarter credit to her good dash away from the pack to break into space and kick an important goal and then backed it up with another stellar goal from a difficult angle to get her side back on an even playing field. She showed great spatial awareness to pass off to teammates and know when to run herself and offered strong leads through the centre. Gutknecht was once again solid showcasing her good hands in the contest to work the ball out of stoppages and pass off to teammates. She showcased her strength while getting tackled to keep her arms free and dish to footy off while she also impressed with her acceleration and ability to break out of the centre bounce. She provided good attacking play had clean hands and ran hard continuously to get to the contest. Gutknecht also provided good link-up play through the middle of the ground thanks to her footy smarts and spatial awareness. Newton showed good spatial awareness and was composed with ball in hand even while under pressure. She used the footy well to move the ball forward and showcased her strong hands taking some solid marks across the ground. Her general football awareness was impressive and she applied good defensive pressure to worry opponents out of the kick. Snow applied good pressure across the field and worked hard to get to the contest. She tackled well on multiple occasions and used her beautiful kick into the forward 50 showcasing her pinpoint precision. Her good vision and acceleration was also a key part in her game and she racked up plenty of timely touches. Lagioia impressed with her follow up work across the ground especially in the forward half to try and trap the footy in the Chargers’ attacking 50. She also showcased her clever use of the footy with timely kicks to teammates and into space. She did the one percenters well chasing hard and applying pressure. Hill was strong around the contest and worked hard to try and win the footy leading the way for her side in possessions. She used her acceleration and clever kicks to push the ball forward and set up attacking bursts for the Chargers. She used her defensive pressure to try and trap the footy and was good around the stoppages extracting the footy. Her clever handballs out of traffic were efficient and allowed her teammates to run into space. Harley was a real presence up forward for the Chargers with her long booming kick and good positioning in front of goals. She helped to push forward and create scoring opportunities for her teammates. She took plenty of strong contested marks and showed a good ability to read the flight of the ball. Harley impressed in the second quarter taking a strong contested mark just outside the goal square and slotting a good goal to finish off the play. She was not afraid to put her body on the line going in hard at the contest. Harley took another big mark just inside the 50 and bombed a long goal finishing the game with three majors. Porter used her clever kicks to get the ball into space and showed good attack on the footy across the ground. She worked hard at the clearances to win the footy and pushed hard into the forward 50 to try and create some attacking play. Porter reads the play well, breaks away from the packs and is a good strong kick of the footy. The bite-sized forward competed well and did contributed some really neat touches throughout the game. A courageous mark going back with the flight of the ball in the second term was a highlight, with Vella hanging on and bouncing straight back up despite a copping a tremendous knock from behind. Her tackling was also willing, and she provided some good balls inside 50. Sheppard was close to, if not the Falcons’ best on the day, winning a wealth of the ball through the midfield. Sheppard terrific coming out of congestion and provided nice forward bursts. Her repeated ground ball gets and long kicks forward were a feature, but she truly did it all across the match. Assuming her usual positon on the wing, Gardiner looked to take the game on and was usually clean in doing so. She showed good awareness on the last line of defence to clean up after a fumble, but was more often seen between the arcs. She capped off her day with a nice running goal in the third term – the only one scored in the quarter. The midfielder has a good step, and used it to move around opponents when looking to break forward. She was effective by foot going inside 50, and constantly finished off runs with long kicks. Like Sheppard, she also finished off her solid display with a goal late on. While the defence as a whole would be disappointed in letting a couple of late goals through, Chapman was solid as a rock inside defensive 50. She copped a knock in the second quarter, but bounced back well to affect a number of intercept marks and shut down many Gippsland attacks. Entrusted with the kick-outs, Chapman spent a good amount of time deep, while also moving towards the arc to cut off Gippsland’s forays. The star Falcon had another day out, putting in a complete shift and looking a class above at times. Utilised at the centre bounces for most of the game, McEvoy showcased her outstanding decision making at the stoppages with clean hands and neat vision to bring her teammates into the contest. Her kicking game was also typically strong, with a particular shot from 50-out hitting the post. McEvoy also tended to play a kick off the ball when it was inside the Falcons’ 50, providing a wall and relentlessly pumping the ball back in, while also being the primary kick-in target. A solid game was capped again by her final quarter goal, which she snared off a Renee Tierney kick and booted into an open goal. Together with Skinner, Tierney was the lead player up forward for Geelong and claimed four of their seven first half goals. Showing good awareness and a deft finishing touch, Tierney took full advantage of the space afforded to her inside 50. Her clever dribble goal through traffic in the second term was a highlight, and she could well have finished with five or six goals had she not missed a couple early. The midfielder battled hard all day against a slick Geelong engine room, attending most of the stoppages and anchoring the centre bounces. Opposed to Lucy McEvoy at times, Abrahams had a good crack and won some nice clearances. Her effort against two opponents to see the ball out in the second term was a good example of her combativeness on the day. Shaw is a leader in the Gippsland defence and despite a difficult day, she made a solid contribution. She had a good one-on-one win on defensive wing early on, and showed her potential in patches. A strong marking attempt against two Falcons in the final term with the game all but over was impressive, and Shaw has a decent boot when allowed space to use it. While Webber was arguably her side’s best, she found the going tough early on starting at centre half-forward. She pushed up the ground to find more of the ball and provide a target to link inside 50, but Geelong hardly gave her an inch when she went near it. Her marking game was solid, and a 55-metre set shot on goal turned into an assist for the Power’s first goal of the game in the final term. A run through the midfield in the second half looked to lift the Power slightly, and she fought well in the clinches. Presented throughout playing forward, getting on the end of a kick inside 50 from Bryanna Arnold and converting the set shot. It would be the Dragons’ only major of the game, but Rothfield continued to cause headaches up forward for her opposition with some powerful marks. She took a great contested grab in the second term, and put her body on the line time ad time again. Rothfield had an opportunity in the final quarter for a second goal, but missed the snap. Played in front of her opponent most of the day and backs herself in to go for marks rather than spoils. Hartwig is clean at ground level and is able to pick up the ball at top speed and take off, which she did in the second term when she scooped up the ball on the run, fended off an opponent and kicked straight down the middle. Later on she showed her second efforts, laying a big tackle after dropping an intercept mark, to win back possession for her side. She won a free kick for a huge run-down takccle in the final term. A big first half around the stoppages and her defensive pressure was very good. She is able to win the contested ball and just get enough separation to move laterally or forward to kick long. Early in the game she showed the perfect way to use your body at a stoppage, getting a low centre of gravity, protecting herself as well as the ball at ground level and buying herself time to dispose of the ball to a teammate while having the space to get rid of it if tackled. In the third term she drifted into defence on a number of occations and showed clean hands and quick disposal, as well as a lovely technique coming out of defence to the wing. A big tackle on Tyanna Smith in the final term allowed a teammate to have a long shot on goal form the subsequent spillage. Worked hard throughout the four quarters and constantly put her body on the line. Along with Alice Burke and Eliza McNamara, Laing won plenty of contested ball and clearances, even if it was just a deft tap or bump off the ball to allow a .teammate to take possession. Laing plays with fierce intend and won a few free kicks, including one in the first term for too high, but her set shot missed to the left. Impressive game along the wing as she has that balance between athletic capabilities and hardness at the ball and ball carrier. She roamed between the arcs and has a long, dangerous kick going inside. Purcell had a big impact in the first half and took a good intercept mark outside 50 to then send the ball back inside. A quieter second half, but she had a chance in the final quarter running into goal, but rushed a little and missed the shot on goal. The captain returned for the Round 2 game and after a quieter first half, started to have a massive impact in the second term. She played on a wing and did not take a backwards step, covering the ground with ease and crashing into marking contests to impact at every chance she got. McDonald laid some big tackles and had a few chances on goal but rued missed opportunities. One went out on the full and the St Kilda recruit berating herself for the missed chance, another was on target from long range but was touched on the line. Her work rate is an obvious advantage and despite it being her first game back this year in competition, she fitted in well. A tackling machine. Shannon played through the midfield and up forward, and her work on the ball was very good, putting her body on the line and also able to shrug off opponents with ease. Shannon has great core strength ad is able to move well when under pressure, and has a fierce attack on the ball. In one instance in the third term, Shannon was outnumbered one against two on a . forward flank, and laid a huge tackle to trap the ball and force a stoppage. She missed a chance lain the same term from long range, but then kicked the final goal in the final term to put the nail in the coffin. The bottom-ager had another impressive game through midfield and was able to find space at times to not only hurt her opponents on the inside, but also on the outside. She loves to win the contested ball, but on a couple of occasions got free and took off, with a ‘wow’ moment in the second term, bursting off half-back and running all the way to half-forward, but just pulled the kick a little to the left. Luckily the ball spilt and the Stingrays were able to create a goal out of the opportunity. While on some occasions she was caught, you had to admire the way she attempted to continually break the game open. In the final term she set up the final goal to Isabella Shannon with great vision in the pocket to spot up her teammate and put it to her advantage rather than blazing away. The defender found herself uncharacteristically in the goalsquare in term one after back-to-back 50-metre penalties and an easy conversion in front of goal. The major was the first of the game, and then Vernon played a solid game in the back 50. She took a great contested mark in the goal square to save a certain goal in the opening term. Often tasked with the kick-in duties, Vernon is a long, accurate kick of the ball and always provided a contest. Finished with a handful of rebounds and a solid four quarter performance. The reliable defender did her job once again, especially under fire in the final term. She did not win a heap of the ball, but when in possession, Hill is calm and composed under pressure and is able to dispose of it cleanly. She forced a rushed behind in the final term and has an ability to get a clean first in one-on-one. Earlier in the game she showed great closing speed and was able to spoil an opponent when at top speed. Brooke Hards had 17 disposals, two marks, three inside 50s, three rebounds and five tackles, while key defender, Tara Slender amassed an equal round-high seven rebounds to go with her 16 disposals, four marks and three tackles, and Eloise Gretgrix worked hard defensively for 13 touches, four marks and six rebounds. For Eastern, Tarni Brown also collected 17 disposals and had four inside 50s while laying a game-high eight tackles, Laura McClelland also found plenty of hte ball with 15 disposals, five inside 50s and six tackles, while Olivia Meagher had 16 disposals, three marks, four tackles and six inside 50s. The standout performer from the match was Western’s Elisabeth Georgostathis who racked up 28 disposals – 22 kicks – two marks, five inside 50s and seven rebounds, while Abby Favell was impressive with 21 touches, five marks, four inside 50s, three rebounds and three tackles. Potential father-daughter selections, Millie Brown and Isabella Grant were impressive with Brown (20 disposals, two marks, three tackles, four inside 50s and two rebounds) and Grant (19 disposals, six marks and three inside 50s) playing important roles through midfield. Cleo Saxon-Jones was ever present with 18 touches and four marks for the Jets, while Sophie Locke (14 disposals, eight inside 50s) and Olivia Barber (13 disposals, four marks and a goal) were also good for the Bushrangers. 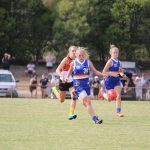 IN Round 2 of the NAB League Girls, Geelong Falcons and Calder Cannons made it two from two, while Northern Knights and Oakleigh Chargers split the points, and Eastern Ranges and Greater Western Victoria (GWV) Rebels went down after Round 1 wins. Subsequently, Bendigo Pioneers, Murray Bushrangers and Dandenong Stingrays recorded their first wins of the year. Bendigo: E. Snell, C. Mitchell, J. Jolliffe. Eastern: J. Grace, S. Gibbs. Bendigo Pioneers bounced back from a narrow loss to the GWV Rebels last week by knocking over Round 1 winners, Eastern Ranges in Round 2. Jordyn Jolliffe booted the only goal of the first term and the Pioneers led by her straight kick. Eastern hit back with the only goal of the second term courtesy of Jess Grace to take a one-point lead into the second half. Bendigo again found an avenue to goal with Chantelle Mitchell converting, before Serena Gibbs added a second one for Eastern in the final term. The Ranges had hit the front, with a few minutes left, before Elizabeth Snell became the hero in the final two minutes with a match-winning goal to hand the Pioneers a three-point win. Eloise Gretgrix was best on ground in the win, well assisted by the strong Bendigo midfgield inSnell, Maeve Tupper and Brooke Hards, while Tara Slender was terrific in defence. Tess Flintoff and Madison Church stood up for the Ranges, while Laura McClelland never stopped trying throughout the contest. Next week, Bendigo travels to Geelong to take on the reigning premiers, while Eastern hosts Oakleigh Chargers at Healesville. GWV: R. Saulitis, L. Sykes, S. Molan. Calder: G. Prespakis 7, A. Magri, T. Crook, I. McNeill-Wren, F. Theodore, T. Gillard. Calder Cannons made it two consecutive wins, with a 58-point victory over Greater Western Victoria (GWV) Rebels. After a tight first half which saw the Cannons lead by just seven points at the main break, Georgie Prespakis moved to full-forward and became a dominant force in the air and at ground level. She piled on seven majors in just a half in the forward 50, equalling the goals record set by three other players. While she was the name on everyone’s lips, Felicity Theodore deserved plaudits for multiple goal assists and a goal herself in that second half, while Georgia Patrikios was also impressive as the Cannons eased her back into the contest after missing Round 1. For the Rebels, Renee Saulitis kicked a ripping goal early, while Sophie Molan continued to battle hard throughout hte contest. Maggie Caris was a dominant force in the ruck, while Lauren Sykes was named the Rebels’ best in the victory. Next week the Cannons take on the winless Sandringham Dragons, while the Rebels host the Dandenong Stingrays at MARS Stadium with both teams sitting at 1-1. Murray: E. McPherson 2, O. Barber, T. Verhoeven, M. Trethowan, A. Morphett. Western: N. Wright, C. Weston-Sirett. Murray Bushrangers put their disappointing round 1 defeat to the Northern Knights behind them to boot five first half goals and set uop a 24-point win over Western Jets. There was no sign of the team that struggled to score against one of the competition favourites, as the home side booted two goals to zero in the opening term, then added three more by half-time to lead by 30 points at the main break. Western slowed the momentum in the third term, kicking the only score of the quarter in a behind, then booted two of the final three goals to cut the final deficit to 24 points. Emilee McPherson was the only multiple goalkicker in the game with two, as the Bushrangers shared around their majors, with Olivia Barber getting on the board and also named among the best. Abby Favell and Teagan Brett were impressive in the victory, while for Western, captain Elisabeth Georgostathis was terrific once again, as was Isabella Grant who backed up her opening round form with another strong performance. Nikita Wright booted one of Western’s two goals, and was also among the Jets’ top players on the day. Murray hosts Gippsland Power next weekend at the Swinburne Centre (Punt Road) as the two Country teams meet halfway, while Western travels to RAMS Arena to take on the Northern Knights. It was a tight contest with both the Northern Knights and Oakleigh Chargers going toe to toe for the entire match. The Knights held a narrow lead for most of the game but in the final term the Chargers came out firing to edge ahead. But in the end neither side could be separated with the Northern Knights sealing a goal in the dying minutes of the game to tie it all up, claiming the first draw of the season. Oakleigh applied plenty of pressure across the ground and stopped the attacking flow of the Knights for large parts of the game, causing some uncharacteristic errors at times. Emily Harley proved to be the key up forward for Oakleigh nailing three goals to keep her side in it, while for the Knights Alyssa Bannan and Ellie McKenzie chipped in with two goals apiece. Speedster Mimi Hill impressed throughout the game for Oakleigh with her timely touches, clever positioning and ability to break away from packs. Star midfielders Britney Gutknecht and Gabby Newton were their dominant selves racking up plenty of touches and hitting up targets. Northern Knights are set to face off with the Western Jets at RAMS Arena while the Oakleigh Chargers will make the journey to Healesville to play the Eastern Ranges. Geelong: R. Tierney 4, M. Skinner 3, L. McEvoy, L. Gardiner, J. Robinson, D. Moloney. Gippsland: G. McRae, C. Robinson. An almost flawless display across the ground saw the Geelong Falcons trounce Gippsland Power by 58 points at Deakin University, helping them soar back to the top of the table. The Falcons’ forward line was a clear feature early as Renee Tierney and Mia Skinner caused headaches for Gippsland’s defence in the first half, combing for all of Geelong’s seven first half goals in deep roles inside 50. With the attack running smoothly and the likes of Lucy McEvoy and Paige Sheppard providing unrelenting service from midfield, Geelong’s defence also stood up well to keep the Power goalless for three quarters of the game. But a final quarter lapse on Geelong’s part saw Gippsland’s Cailin Robinson take full advantage to slot through her side’s first major of the day, with Grace McRae adding to the total in the face of another three Falcons goals. Darcy Moloney and Laura Gardiner finished among a long line of Geelong standouts, with the bite-sized Elise Vella also doing a few neat things. Gippsland star Nikia Webber was her side’s clear best from half-forward and through the midfield, while McRae was another valiant trier alongside Chandra Abrahams, who fought well in the engine room, and Megan Fitzsimon. With a perfect record intact, the Falcons will now go on to face Bendigo at Deakin once again on Sunday, while the 0-2 clash with Murray in an all-country clash at the Swinburne Centre in Richmond on Saturday. Dandenong: B. Vernon, I. Shannon, A. Liddle, J. Radford, G. Howes. Dandenong Stingrays have run out 20-point winners against an inaccurate Sandringham Dragons outfit at RSEA Park, Moorabbin. The Stingrays had the same amount of scoring shots as the Dragons, but converted five of their 12 attempts compared to the Dragons’ one. The one goal came in the first term when Soph Rothfield converted a set shot to match Brooke Vernon‘s major which came after back-to-back 50-metre penalties. Despite never having the game under control, the Stingrays booted the final four goals of the match, and when Isabella Shannon broke through to give the Stingrays a four-goal lead, it looked done and dusted. The Dragons relentlessly attacked in the final term, but missed some golden opportunites and it will be a great learning curve for them going forward. Marguerite Purcell and Eliza McNamara were huge in the midfield with Alice Burke for the Dragons, while Tyanna Smith and Shannon were tough for the Stingrays. Molly McDonald got better as the game went on, while Zoe Hill and Sarah Hartwig were consistent as ever up their respective ends. Next week the Dragons take on the undefeated Calder Cannons, while the Stingrays face the GWV Rebels at MARS Stadium. IN the opening round of the NAB League Girls season, our writers took a look at all six games and some of the players that the respective Female Talent Managers regarded as ones to watch throughout the season. All notes are opinion-based on the individual writer. The small midfielder with good pace continually cracked in hard throughout the game. Her hard effort was best exemplified by her mark in the third term, going back with the flight with pressure coming from behind. She showed good core strength and smarts at times to keep the ball in front of her, whether by paddling along the ground, or getting it to a teammate in a better position. She showed clean hands throughout the contest and won a fair chunk of the ball early in the final term, perhaps the next step is more penetration on kicks. Overall a hardworking performance. Had a few nice plays with a quick handball off the deck to Makeisha Muller in the second term to create a scoring opportunity, as well as a good kick to a teammate’s advance. In the final quarter, Barba created some run off half-back and cleanly handballed to Theodore. Muller made things happen up forward, and while she hit and miss when going for goal – rushed at times – she had some eye-opening moments. After missing a snap on goal in the second term, Muller had another chance moments later with a shot sailing through using the breeze perfectly. She continued to present throughout the contest and almost had another goal but it was rushed across the line by an opponent. The standout best on ground, it is hard to believe Prespakis is yet to turn 16 years of age. Much like her sister Madison, some of the things she does cannot be ignored. The way she positions herself at stoppages and moves through traffic is a highlight and she has a booming kick that is used to put opposition defenders under pressure by putting it deep inside 50. Prespakis moves well and has good composure and made what was one of the goals of the day look simple. She won the ball, turned, shrugged off an opponent and snapped one home. She is a natural kick of the football and also worked back defensively to take an uncontested mark in defence later in the game. Prespakis had a chance for a second goal but missed to the left. Beautiful evasive skills to work her way through traffic and kick a goal in the first quarter. She broke a few tackles throughout the game and showed good spatial awareness. Grant ran hard both offensively and defensively and contested well both in the air and at ground level to win the ball back for her side. Had a really good passage of play where she worked her player inside and out to shrug off a tackle and try and kick to a teammate highlighting her impressive footy IQ. Georgostathis impressed with her speed and ability to opens up space across the ground. She provided plenty of good forward momentum with her clever use of the ball to hit up teammates cleanly. She showcased her good evasive skills, sidestepping opponents with ease and was calm solid under pressure highlighting her ability to think her way through tricky situations. The midfielder got her hands to plenty of the ball, proving how deadly she can be with ball in hand. She was really good in the contest and displayed her footy smarts throughout the game with her clever kicks to her teammates advantage. Georgostathis was not afraid to break out of packs, extracted the ball cleanly from congestion, read the play well and constantly got involved in the passage of play. She hunted both the ball and player throughout the game, laid good strong tackles. In the final term of the match she took an impressive contested mark against two opponents, proving to be a real playmaker for her side credit to her skill and commitment. Pritchard went in hard for the ball all game and worked tirelessly at the contest. She had quick hands, was good in close, and used her strong kick to try and clear congestion. At times, she could improve her composure, but she had moments of brilliance especially in the last quarter where she laid a goal saving tackle, lunging to stop her Calder Cannons opponent from scoring. Pritchard applied good defensive pressure throughout the match. She took a good strong mark in the first quarter and used her long booming kick to help set up play in the forward half on more than one occasion. Saxon-Jones provided a good option in the attacking 50, contested hard to win the footy both in the air and on the ground and cleared the ball well throughout the course of the game. One of Bendigo’s best, Hards did not take a backwards step. Occasionally she would be pinged for holding the ball, but her attack and desire on the ball is what you like to see. She constantly put her body on the line, but also managed to find space on a wing and at half-forward. At one stage she won the intercept ball, fended off an opponent and kicked inside 50. Clean at ground level and a long kick, it was a solid performance from the number four. Was not a huge ball winner, but her kicking was a standout. She had a piercing kick from half-back to the wing in the first term, not only hitting its target, but being low to avoid a spoil from an opposition defender. She can turn out of trouble and also run both ways, intercepting the ball at half-back and kicking long to the wing. Played a real team-orientated role in the middle of the ground and regularly went in hard at the coalface. Along with Hards provided some great inside support, replacing the work that Megan Williamson did last year. Was one of the most consistent Pioneers players on the day and won more one-on-ones than she lost. Played at full-back and certainly teamed well with Tara Slender in the key defensive posts. She is strong one-on-one and just clears the ball from danger every chance she gets. Douglass held her ground under immense pressure on a number of occasions and if not able to dispose of it long by foot, looked to release a running defender. Kicked a couple of goals and showed enough to suggest the over-ager will add an important element to the Pioneers’ attack. Having missed last season due to injury, she played out of the goalsquare and looked dangerous in the air, then pushed into the midfield at times and also had an inside 50. A mark running back with the flight about 25 metres out showed great courage. She attacked the goal face early on narrowly missing then backed up her efforts in front of goal scoring a freakish goal in the first quarter. Saulitis was on a tricky angle she turned, took a few steps and slotted it straight through the middle. The party tricks did not stop there for the talented forward nailing another impressive goal in the third, showcasing her ability to read the play well. She roved the ball off the back of the pack turned around and nailed a goal from just outside the goal square highlighting her footy smarts and good goal sense to position well and score. Showed good attack on the ball and was not afraid to hunt the player to win the contested ball. Wood worked hard to win the footy for her team and had a good presence around stoppages to makes herself available. She got into clever positioning across the ground and showed good dash through the middle. At times her execution was slightly off, but the endeavour and intent to attack the play was there, helping to set up many forward thrusts. Good strong spearing kick and knows how to use the footy to maximize her impact per possession. She is clean with ball in hand, helps to set up good attacking play and worked hard in the attacking 50. The captain scrapped well to try and win the loose ball at ground level and showcased her pin point precision with timely and accurate passes. Molan has good spatial awareness and used her clever sidestep to avoid traffic and shrug off opponents. She roved well off the pack and tried to clear space with her long kick over the top. Molan displayed her good hands under pressure to take a big mark coming out of defence and willed herself to the contest on a few occasions. She proved to be a good option up forward and continued to present time and time again. Dojiok was really quick off the mark and showed good closing speed to shut down her opponents. She went in hard at ground level to try and trap the footy and marked her player closely showing good defensive pressure. Dojiok highlighted her good evasive skills to get in and under the tackler then dash through the centre. In one passage of play she put the afterburners on and tried to hit up a teammate in the forward 50. She broke the game open in the third with her impressive speed and run through the middle of the ground, taking a bounce and kicking the ball long inside 50, creating a half chance at goal for her teammates. Scored a good goal in the opening term and took a few solid marks. Simmons provided some good strong leads in the opening quarter and kicked her second goal for the first quarter. She was cool, calm and composed under pressure with a shot after the siren in the first and showed good spatial awareness. Simmons showcased her footy smarts to evade players and then run through the middle of the ground and provided some good link up play through the middle. Caris impressed with her clever use of the ball to open up space and set up a scoring opportunity for her teammates. She was solid in the ruck with some clever taps to advantage to her teammates and used her height to try and dominate the opposition. She moved well across the ground evading opposition after winning the footy in the air, proving her versatility and class. Hit the post early on but showed good goal sense throughout the game to be a viable option up forward, later scoring a goal. Morris-Dalton impressed with her ability to read the play and showed good footy smarts to body up and control the footy. She had solid hands under pressure and at times looked to have plenty of time and space with ball in hand. Morris-Dalton also helped to set up good attacking play for the Knights. Bannan displayed a good use of footy to kick the ball into the forward half and mount some forward pressure. She nailed an impressive goal in the last quarter quickly turning and finding the goals credit to her clean use of the footy and general goal sense. Bannan took a good intercept in the forward 50 and worked hard to apply pressure, ride the tackle and keep her arms free to release a handball. Beautiful kick of the footy kicking a goal in the second term and showed good hands under pressure. Bennett applied good tackling pressure to try and trap the footy in the Knights forward half and displayed good awareness to avoid the tackler and tap the ball back into play. ?? Fitzgerald had clean hands under pressure and impressed in one passage of play with an easy pick up off the deck, followed up by a clever kick toward to trap the ball inside forward 50. She showed good speed to break away from the pack and handball out of stoppage to a passing teammate to try and set up a shot at goal. Sansonetti took a good strong mark back in defence and showcased her kicking ability with a long kick over the congestion into space. She displayed good body positioning on her opponent to win the footy and attacked the footy hard. She proved she was not afraid to go in hard to meet the contest. McKenzie was clean out of the centre, had good ball skills, showed good control with the footy and hits targets up on the lead. She took a strong contested mark, and highlighted her impressive aerial abilities along with her impressive spatial awareness to hit up teammates on the wing. She starred in one passage of play with a strong intercept mark and then propelled the ball forward. McKenzie displayed her clever sidestep out of traffic, fended off two players and kept arms free to release ball to teammate proving her class. She racked up the clearances credit to her clean hands in and around the footy and opened up space across the ground. McKenzie highlighted her football skill in the second quarter receiving a handball and going for a run, fending off two players and almost delivering the ball inside 50 to a teammate. She slotted any early goal credit to her clever snap. Gutknecht accumulated plenty of touches with a good pick up off her toes and proved to be a real play maker through the middle. She ran hard across the field to try and interfere with the play and slotted an impressive goal from 50 thanks to beautiful long kick. She strikes the ball well, showed good spatial awareness and impressive footy smarts. Her composure under pressure was second to none slotting an impressive four goals for the game. She took a heap of strong contested marks across the ground and was a real presence across the field. Gutknecht seemed to have the ball on a string in the last term racking up the possessions.?? Clever play in the forward half and showed an impressive goal sense and ability to get boot to ball. She was clean around the ground scooping the ball up in one hand. Newton took a really good mark in the forward 50 and showcased her footy smarts with a clever chip kick to hit up teammate in a better position. She tackled hard to try and win back possession for her side and impressed with her follow up play across the field. Was not afraid to accelerate forward and open up space and showed good presence around the stoppages. Snow was not afraid to go in hard and extract the footy from the stoppages, getting down low. She tackled hard throughout the game and had clean hands in close. She highlighted her footy smarts with a good chip kick in the middle of the field to open up the forward 50 and create a scoring opportunity for her side. Snow took a few strong marks and was clean with ball in hand with a good hit up kick to teammate in the forward 50. Adams rotated between midfield and defence, playing half-back, on. a wing and onball, using the ball consistently, and was able to use short kicks to hit-up targets on the wing. Against the bigger bodies she got pushed around a little, but never gave in, winning an important one-on-one late in the game. Favell showed some promising signs around the ground, both offensively and defensively. Early on she took a good mark on the lead at half-forward and delivered a low pass inside 50 to a teammate. She ran down an opponent in a tackle and seemed to just keep running throughout the day, trying to get the Bushrangers moving in transition. Like many players, did not win a heap of the ball, but she constantly put pressure on the opposition. She cracked in hard and laid a great tackle on her opponent in the second term to force a turnover. In the final quarter, she laid another terrific tackle that was rewarded with a free kick. Her defensive efforts were very good and she helped out a defence that was under siege at times. Showed some nice signs throughout the four quarters in the air and at ground level. She made a number of strong second efforts and was able to use the ball well. She laid a great running tackle later in the game to earn a free kick, and was able to fire a handball off to a teammate while Barber was still on the ground. Playing on a wing and half-forward, Jordan had a quieter first term before getting into the match more from the second term. She pressed up from half-forward when the ball was in defence and provided an option out wide. She kept running to find space and took a huge grab in the final term to put the ball in the path of Tyanna Smith to run onto towards goal only to just miss. The Saints’ AFL Women’s recruit kicked the first goal of the game for the Stingrays with a snap in traffic. She kept presenting at half-forward taking a. number of marks, but also won the ball off the deck. In the third term she won a few possessions at half-back, and showed a few quick steps out of a centre clearance to bomb the ball long and deep inside. 50. Smith worked hard for the Stingrays in the midfield and kept running all day long. She showed off her clearance ability time and time again, being a danger around the stoppages and just attacking the ball hard. She gave away a few free kicks throughout the game, but constantly harassed opponents with frantic tackling or implied pressure. She had clean hands and smart thinking to use the ball by hand out of a. stoppage, and had the chance to give Dandenong a huge shot running into goal in the final term, but it just missed to the right. An underrated performance from the defender in a role that can be unforgiving, but Vernon was terrific on the last line. She saved at least two goals that Eastern would have otherwise kicked, which included a goal-saving smother in the second term, and then bumping her opponent off the ball in the goalsquare as she tried to soccer it home. While the Stingrays did not win, Vernon’s actions kept them in it, and she was so calm and composed under pressure, and has a long kick that clears the defence. The best from the Stingrays. The Stingrays full-back is a rebounding machine, who just is as consistent as they come. She is a good mover in traffic, and a long raking kick. She is one that tends to have Velcro hands at times and can win a contested ball at ground level too. Still a bottom-ager, but she has quite a few nice traits and consistency on her side. A huge first half by Meagher set the tone for Eastern, winning a number of intercept possessions as well as contested ball at the bottom of packs. She won the ball in all thirds of the ground, and either kicked forward or looked for the quick handpass to a running teammate. She showed good smarts throughout the game and had a few nice touches and applied pressure to opponents. Classy. It is the easiest way to describe Brown who has unbelievable agility, speed and technique, it is just ironing out areas such as assessing her options at times which would make her go to the next level. She can kick it long and has no issues finding space, and when she does have space in front of her, it is hard to stop her. The daughter of former Magpie captain, Gavin Brown, the smooth mover showed just how much speed she had in the final term with a blistering run, quick handball to a teammate, receive and then kick inside 50 which covered about 40 metres. Her metres gained would be remarkable, and while she does need to just build that consistency by foot, the technique is there. The AFL Women’s Academy member took some huge grabs, including a ridiculous contested mark where she read the flight perfectly despite being in the middle of two opponents. She kicked a terrific goal in the second term after intercepting the ball at half-forward, taking a few steps and never looked. Like missing. She showed clean hands off the deck and spreads well, it is just cleaning up the kicking at times that would be the next step, but McClelland has a lot of tricks. The netballer showed some serious talent, and while consistency in finding the ball is an area to build upon, her kicking was surprisingly impressive for a code-crosser. Gibbs lead at the football and by bringing the ball to ground created a goal to Mietta Kendall in the second term. Then she speared a pass into another teammate despite being hugged on the boundary line, and was finally rewarded in the last term with a goal for her efforts from a nice snap. The classy mover did her thing throughout the match and spread across the ground to win the ball on the outside. She got her side on the board with less than 30 seconds remaining by side-stepping an opponent, straightening up and putting though a major just before quarter time. A one-grab player who is clean by hand or foot, she knows how to weight her kicks and angle them. The Chargers’ captain won a lot of the ball, particularly in the first half. She played off half-back and was the general in defence, clearing a lot of Gippsland’s attacks. As the Chargers had more control in the second half, she was needed less, but she still found a way to be involved, pushing up the ground and winning the ball. Showed nice vision and neat foot skills. The difference between the teams as the key forward target inside 50. After a quiet first term where she gave away a free kick or two, she became the one that forced the opposition defenders to infringe on her. She was pushed out of a contest in the second term, earned the free and made no mistake with. The set shot. She had another shot early in the third after protecting the drop zone, marking on her chest and setting sail for goal. It fell short but was marked by Kalarni Kearns who slotted it. Another chance for a major off a huge pack mark resulted in a poster, but Harley quickly rectified the missed with a loose ball get and snap goal. She nailed her third goal after a dominant one-on-one after almost converting another chance moments earlier on the run. She capped off a dominant, best on ground performance with her fourth goal early in the final term. The speedy midfielder showed some great signs throughout the match and had one really impressive play in the second term. She. Won the ball at half-back, ran along the wing burning off an opponent and then hit a teammate at half-forward while at top speed. Earlier in the game she missed a chance for goal after going back with the flight then receiving a 50m penalty. Often being held trying to get out of a stoppage, Porter was able to buzz around and use her speed to clear the ball throughout the game. Abrahams has always had the offensive ability to pull down a massive contested mark – which she did a couple of times during the game. But her tackling pressure and defensive work against Oakleigh was very impressive. While the consistency is still there to be built, her work in the middle and on a wing was really solid, and laid a crunching tackle on the strong Emily Harley in the first term. A team contributor throughout the match. Played off half-back and applied pressure to the ball carrier at times, earning some free kicks for her troubles. In the first term she was hurt as she won a free for a run-down tackle then as she played on was tackled herself and got up ginger. She came off but returned to still play an important role. Looked in for a big game when her first touch saw her win it at ground level, turn around with a snap and slam it home for the opening goal of the game. After the first term the forwards were limited and Webber spent most of her time in the midfield where she used her strength to win contested ball. The attribute that sets Webber apart from the rest of her peers is her elite kicking which not only hits targets, but can do so over long distances. Her tackling is fierce, and while she gave away a number of free kicks, Webber continually tried to win the ball back for her team. An example of a second effort came in the second term where she dropped a mark, followed it up, won the contested ball and then moved clear and kicked it long. Played on Lucy McEvoy early and the two had an entertaining battle. Well suited to the role as she is strong one-on-one, Hartwig held her own and took some strong marks against tough opponents. A couple of times she was beaten when opponents had front position, but she was often able to either get the hands up or spoil it to keep the ball alive. She took a number of important intercept marks, enjoying the freedom of being able to still hold a defensive role, while attacking from half-back, once McEvoy moved into the middle. Hartwig won a big one-on-one contest from the back position in the final term as the Falcons were charging home. Playing an inside midfield role, Burke just went in hard from the first to final sirens. She covered the ground well and laid some really hard tackles throughout the contest. She has that outside ability, but her willingness and ability to extract a ball from a contest saw her remain in that onball group. Burke got to show off her skill in the final term with a nice weighted kick to Winnie Laing in defence. Showed some nice speed on the wing and was able to get a few quick kicks out of the stoppage. Roamed around and moved in transition, she was one of Sandringham’s better midfielders and was the outside mover to many of the Dragons’ inside brigade. Played along a wing and just fights for the ball. Her decision making and vision was good on the day, and was able to hit-up Lucy McEvoy between a couple of opponents in the second term. Always likes to keep the ball moving, Sheppard beat two opponents on the wing in the final term to kick forward and let the Falcons maintain possession. A bit like the energiser bunny with ball in hand, Moloney just keeps it moving. She is one of those players that immediately looks to play on wherever possible, and has the athletic traits to be able to do so. Moloney has lightning first few steps and is able to dance around an opponent. In the third term she had one of the plays of the weekend, when she was one-on-one, handballed over her opponent, ran onto it, burnt off her opponent and kicked the goal on the run taking into account the wind. It was a very impressive moment. Started in the middle then moved forward with Sarah Hartwig for company. She just willed herself to contest after contest, and continued to do so throughout the match as she then moved back into the midfield. With McEvoy on the ball, the Falcons were able to get the ball forward courtesy of her long booming kick. She was constantly involved and her follow-up work and work ethic are an example of what every player can aspire to. Even if she loses a contest, she will be laying the next tackle or putting her body on the line every chance she gets. Copped a knock to her shin early in the second term, Tierney started higher up the ground then went back deeper to where she is more familiar. Kicked a good goal, but also missed a couple of opportunities. Continued to present as you would expect from your forwards, and she applied some defensive pressure as well. AFTER a long off-season, the Under 18 Girls competition returns to Victoria, with the 12 teams reset for 2019. Geelong Falcons went undefeated in 2018, while the Northern Knights fell short of upsetting the Falcons in the Grand Final having impressed throughout the competition as well. There is plenty of future talent on show over the weekend with fans treated to two triple headers on Saturday and Sunday respectively. Six sides make the journey to RAMS Arena in Craigieburn on Saturday with the games moved forward to allow the girls to escape the heat of the day with predicted temperatures reaching the high 30s. On Sunday, the remaining six sides head to Skybus Stadium in Frankston to kickstart their campaigns for the new season. The first game of the year sees the Cannons taking on the Jets, with Calder missing star midfielder/forward, Georgia Patrikios. A familiar name can be found in the midfield, with Georgie Prespakis replacing her sister Madison in the onball brigade, while Felicity Theodore is another name to watch, named in the forward pocket. Western has a number of strong talls in the team with Isabella Grant, Cleo Saxon-Jones and Isabelle Pritchard able to hold down key roles, with Grant also running through the midfield with last year’s best and fairest winner, Elisabeth Georgostathis. In the second game, Bendigo Pioneers are coming off a promising practice match win over Murray Bushrangers and have a strong spine with Kate Douglass and Jordyn Jolliffe holding down key positions at either end, while Tara Slender was impressive in the V/Line Cup last year and will slot into centre half-back. Jemma Finning, Brooke Hards, Maeve Tupper and Eloise Gretgrix make up a young but promising midfield core, which will make for an entertaining contest against GWV Rebels’ Ella Wood, Chloe Leonard, Sophie Molan and Isabella Simmons. Renee Saulitis and Nyakoat Doijiok are others who impressed at times last season and will add some speed to the side that will hope to get off with a win after such a strong finish to the year last season. In the final game of the Saturday triple header, grand finalists Northern Knights face the Murray Bushrangers. The Bushrangers will be without top prospect, Millie Brown, but have the likes of Sophie Locke, Olivia Barber and Kate Adams who all add different elements to the side in a team that looks different to the one that ran out in 2018. The Knights are a formidable side and with Gabby Newton, Ellie McKenzie, Alyssa Bannan, Abigail Bennett, Britney Gutknecht, Jess Fitzgerald and Sarah Sansonetti all named, it will take a strong performance to knock the Knights off. Heading down the Peninsula on Sunday, Dandenong Stingrays host Eastern Ranges in the first of three matches at Frankston. One half of St Kilda’s newest recruits will be playing in the match, with Isabella Shannon named at centre half-forward, while the Stingrays will miss Molly McDonald. Tyanna Smith is a bottom-ager to watch throughout 2019, as is key defender, Zoe Hill. For Eastern, Laura McClelland is the key top-age player to watch, named in the middle, while Olivia Meagher and Tahni Brown make the Ranges’ midfield a tough proposition for any side, and with Tahlia Merrett and netballer, Serena Gibbs up forward, there are no shortage of tall targets inside 50. In the second game, Oakleigh Chargers takes on Gippsland Power in a repeat of the same fixture 12 months earlier. In that game the Chargers were far too good, but after a strong pre-season, the Power hopes to start the season off on the right note. Gemma Lagioia will be a player to watch off half-forward, while Emily Harley is a key target inside 50. Alana Porter provides the dash, while Chloe O’Malley and Nicola Xenos are defenders who know how to use the ball going forward. Gippsland has named Nikia Webber at full-forward for the opening game, but she could rotate with bottom-age tall Chandra Abrahams who will start in the midfield. Holly Andrews and Maddi Shaw will be others to watch off their respective flanks, while Shanara Notman has good potential having returned to football after a year off. Wrapping up the first round of action is arguably the match of the round with reigning premiers, Geelong taking on Sandringham Dragons. The Dragons have a good bottom-age contingent who will look for guidance from new captain, Molly Denahy Maloney, with Alice Burke and Eliza McNamara forming a strong inside midfield. Marguerite Purcell provides the outside pace, while Isabella Eddey will cause headaches inside 50. Down back, Sarah Hartwig looks to hold down the defence. For the Falcons, captain Lucy McEvoy and Luka Lesosky-Hay will team up in midfield, while Renee Tierney is the main target inside forward 50 among a number of players who have made the transition into the side. Abbey Chapman and Kaitlyn Haustorfer are very solid key defenders, while Elise Vella is a winger who could be a point of difference.